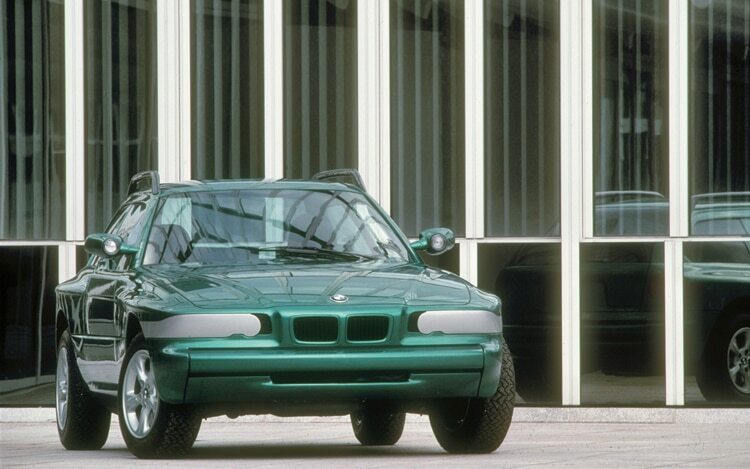 In 1985, when BMW was on a serious roll, Executive Board member Wolfgang Reitzle established the German version of a skunk works “to develop innovative, future-oriented and original overall vehicle concepts and sub-concepts away from the constraints of a specific series workflow schedule. 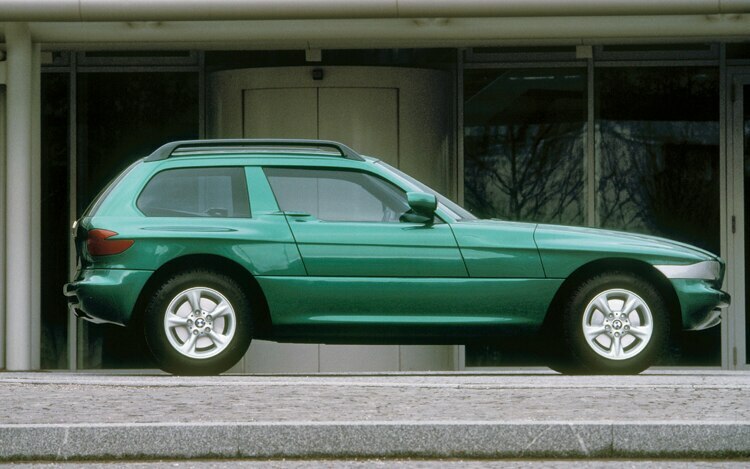 The objective should always be to develop solutions that have the potential for series development.” Ulrich Bez, a brilliant engineer who is now Aston Martin Lagonda’s CEO, served as the new BMW Technik’s first director. 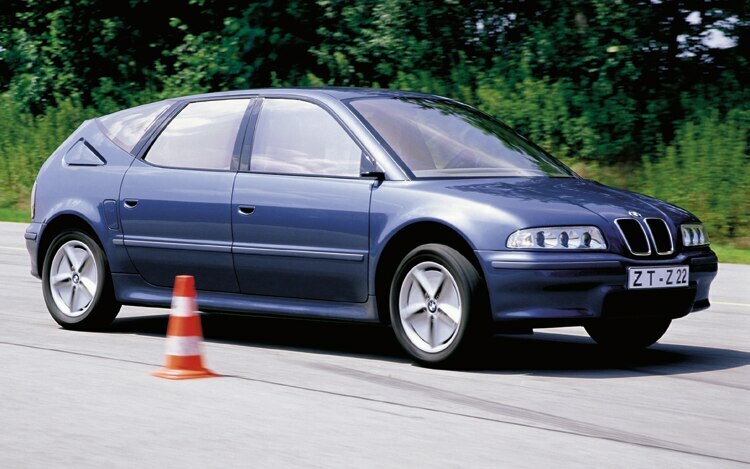 To get the ball rolling, initial efforts were placed under Auto 2000 and Local Vehicle project titles. 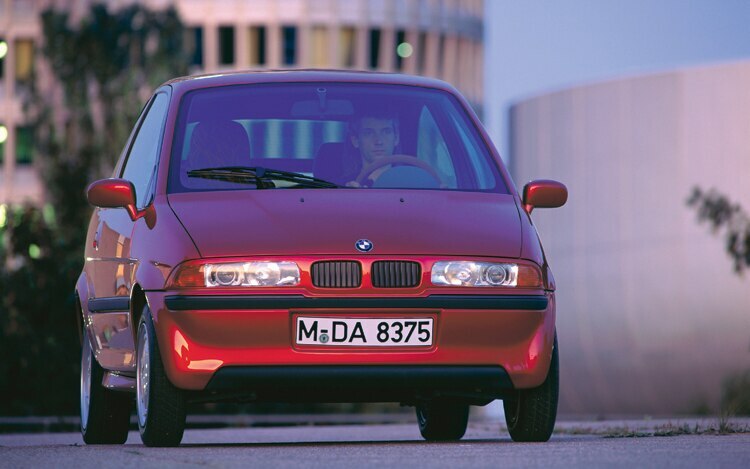 Over 18 years, the Technik crew concocted 29 project cars to explore various future possibilities for BMW. 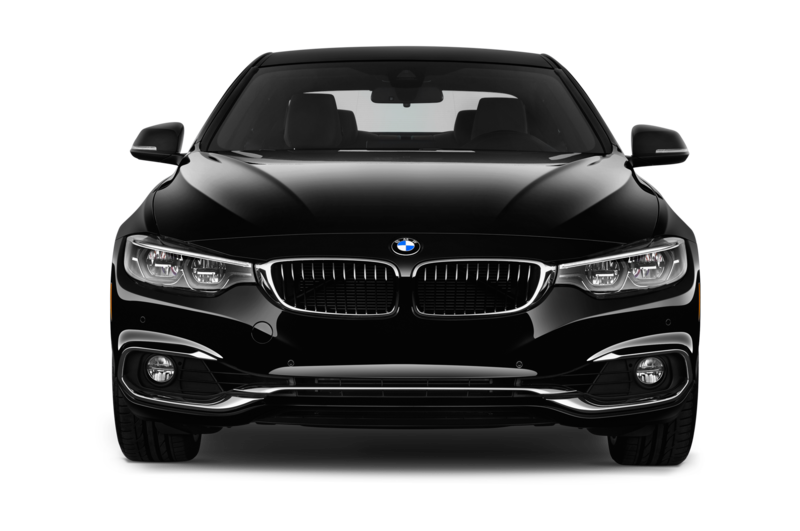 Inevitably, the business mood changed and by 2003 the Executive Board was less interested in any department having so much fun. 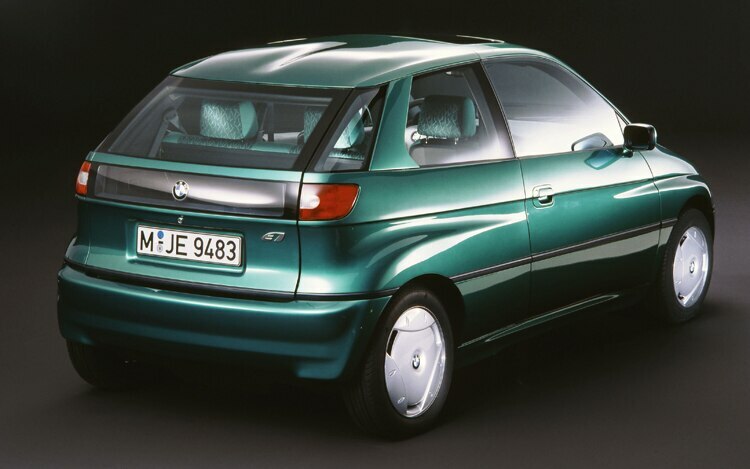 (Bez was long gone, having moved to Porsche, Daewoo, and then Ford.) 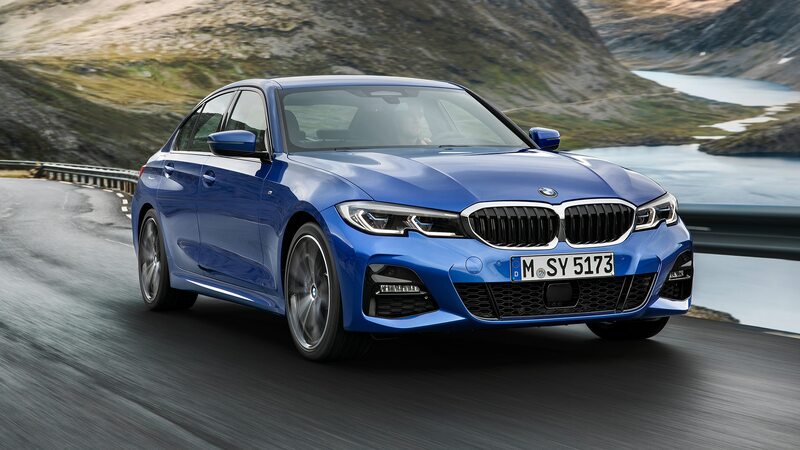 So the German word for research was added to the department’s title and BMW Forschung und Technik’s focus was shifted away from complete running project cars to more specific technical exercises-such as using hydrogen as a carbon-free fuel for combustion engines. 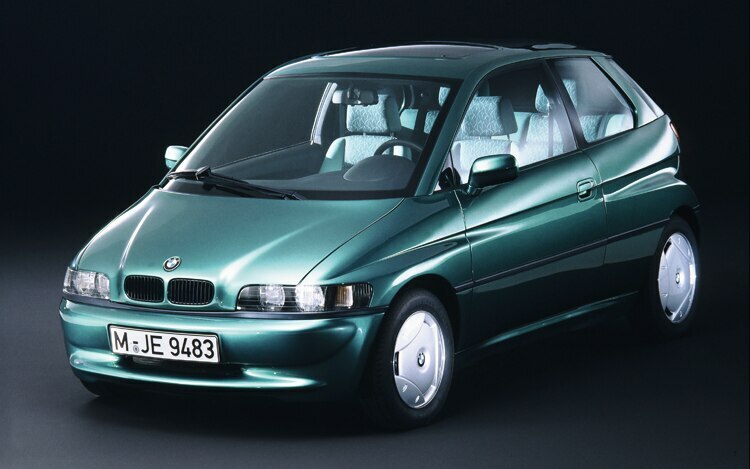 Those project cars that survived the shredder began collecting dust like discarded children’s toys. 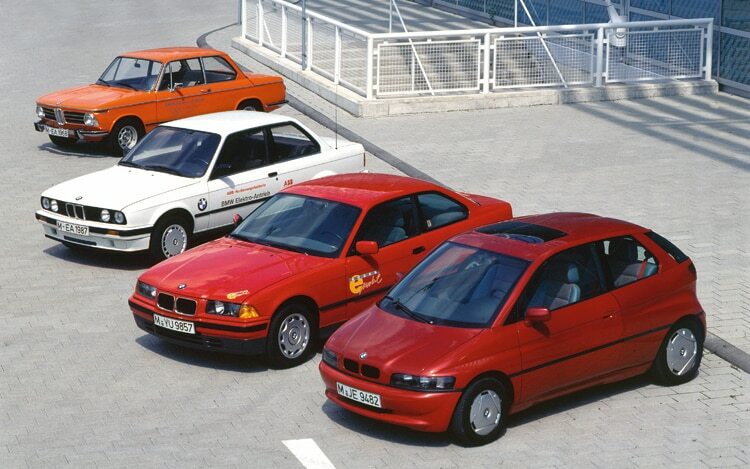 Thankfully, someone in authority who appreciated BMW’s heritage suggested a party to celebrate the 25th anniversary of Technik’s founding. 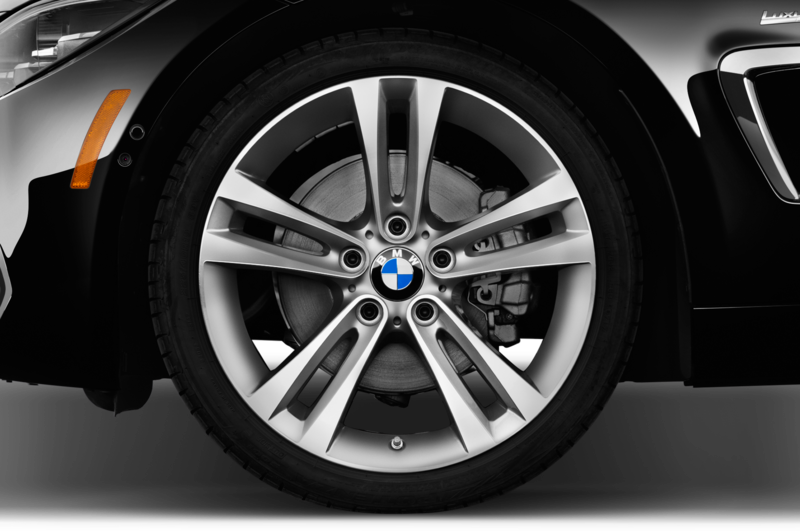 The cars were dusted off and rolled forth for the automotive world to enjoy. 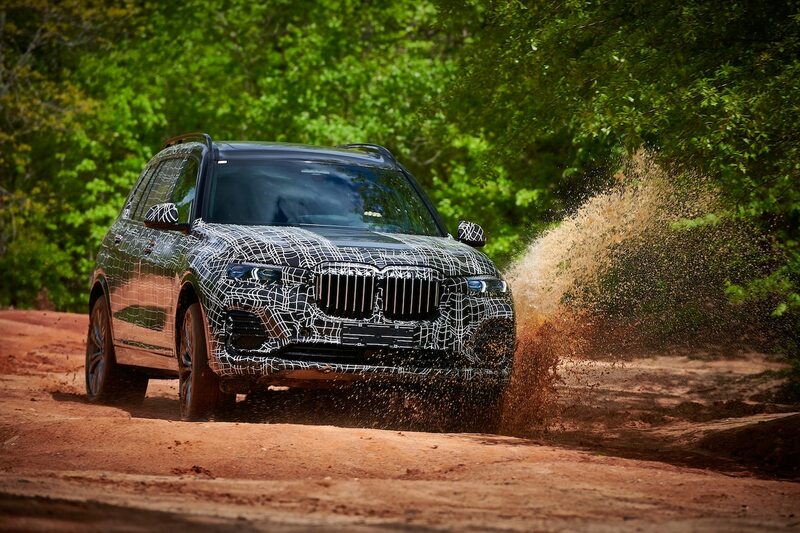 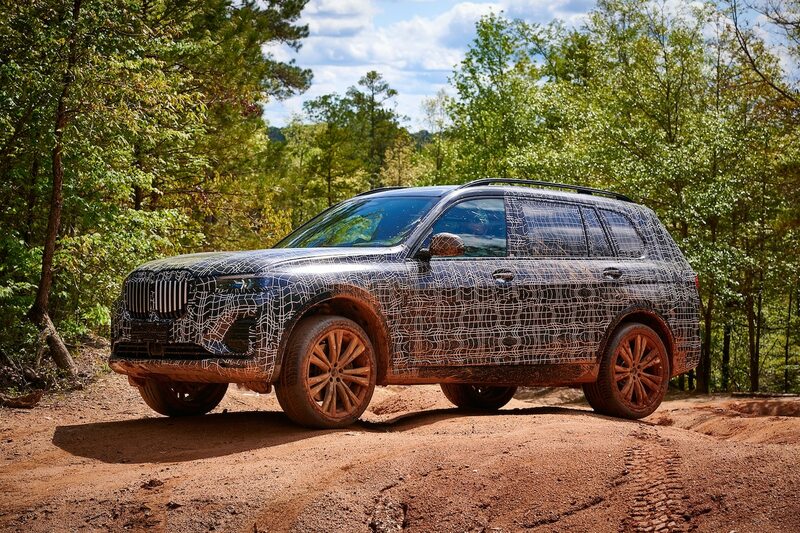 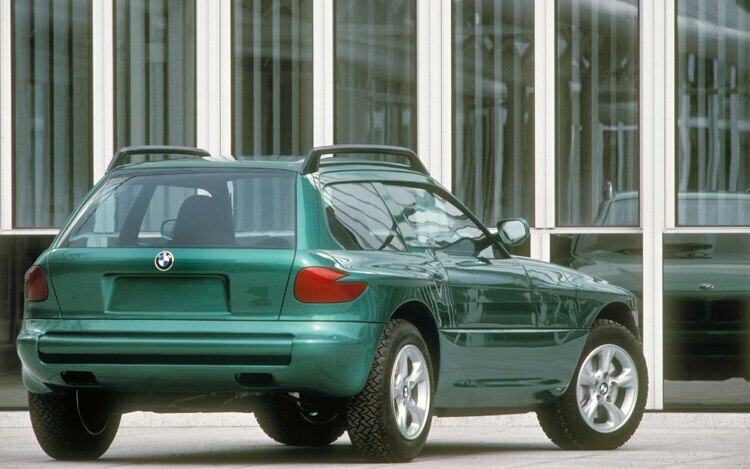 A sampler of the most interesting experimental BMWs follows. 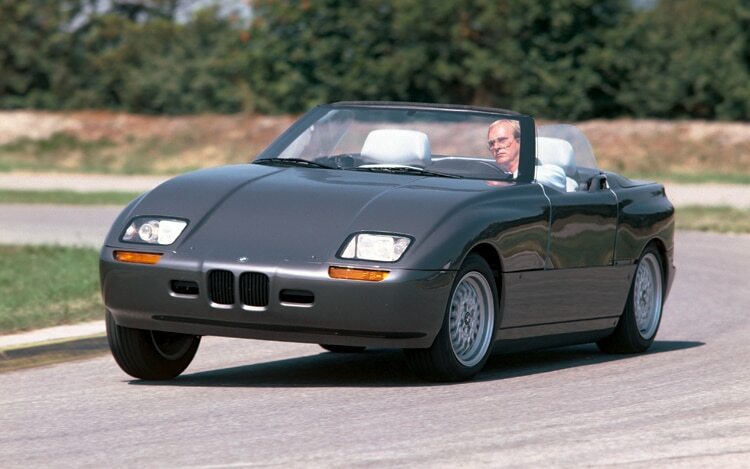 Created in 1985, the Z1 investigated advanced structural and material concepts. 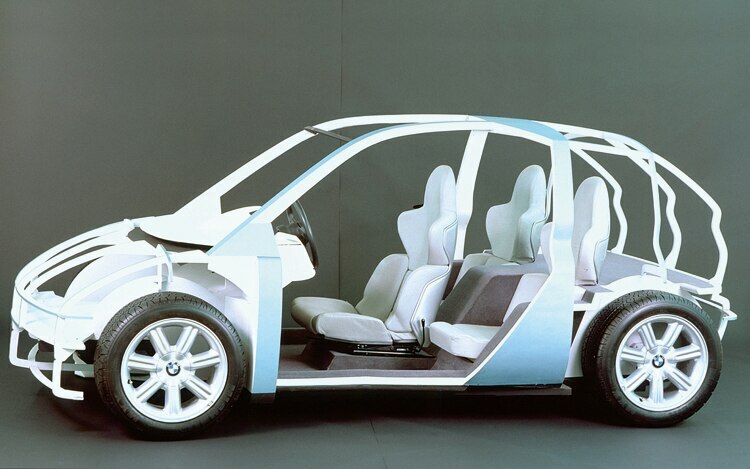 A steel spaceframe was clad in thermoplastic body panels and reinforced with a bonded composite floor panel. 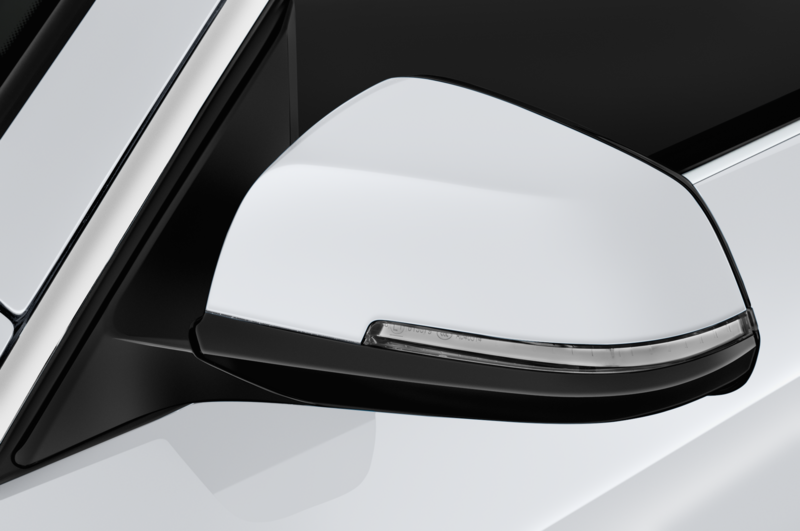 Sills were raised to provide extra side-impact protection and space for the unorthodox vertically sliding doors. 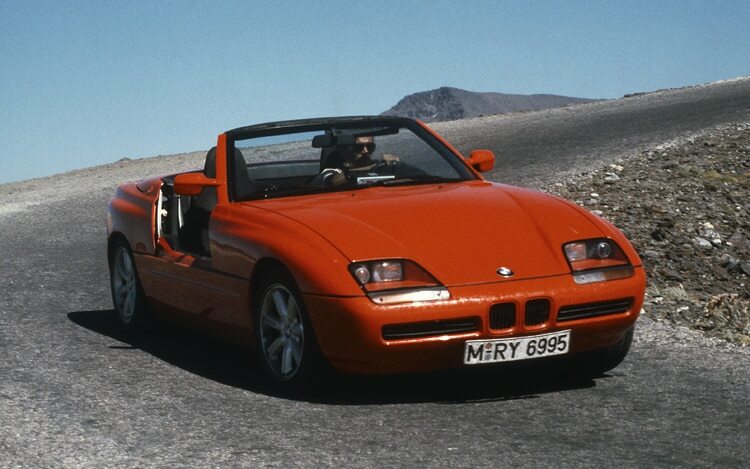 While that arrangement seems impractical, the Z1 not only provided convenient entry and exit, it could also be driven safely with the doors lowered. 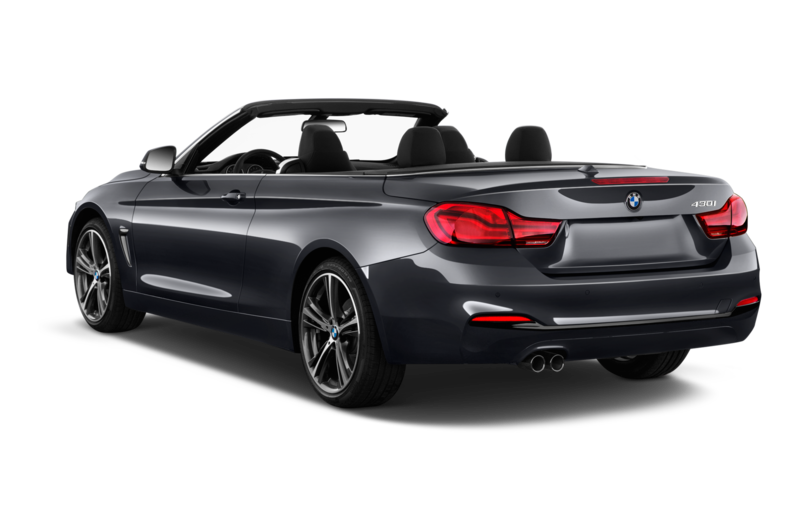 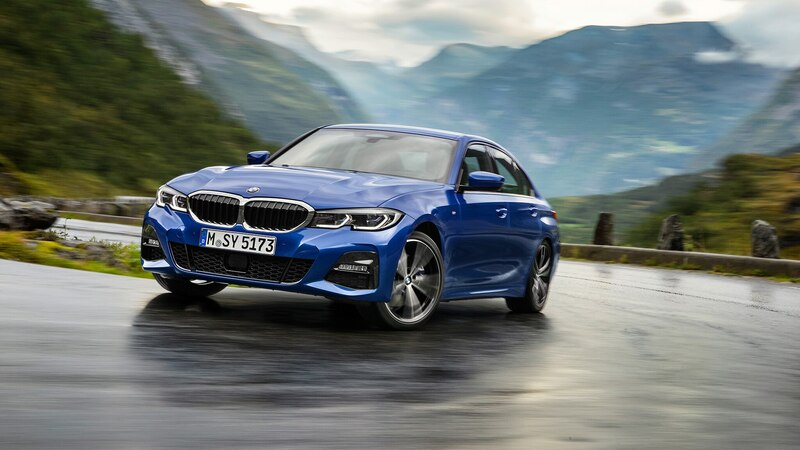 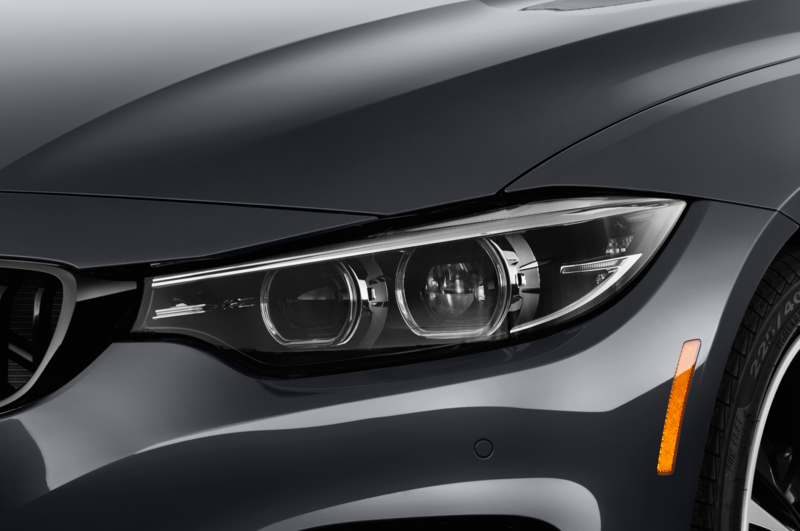 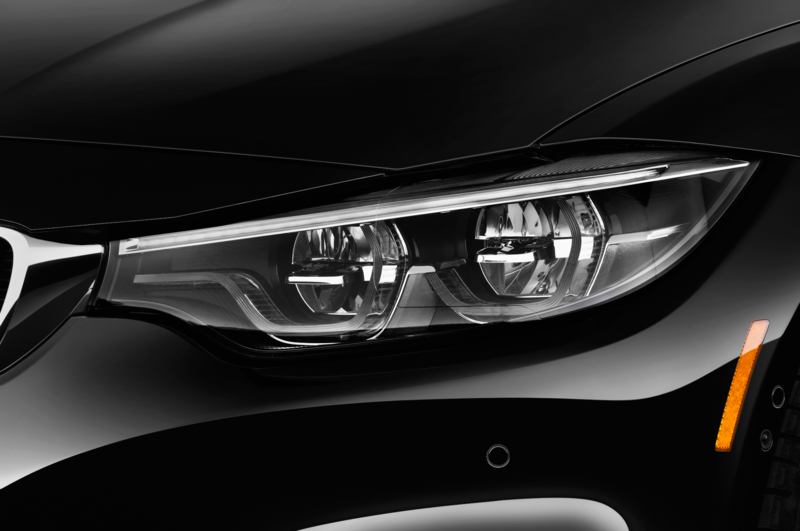 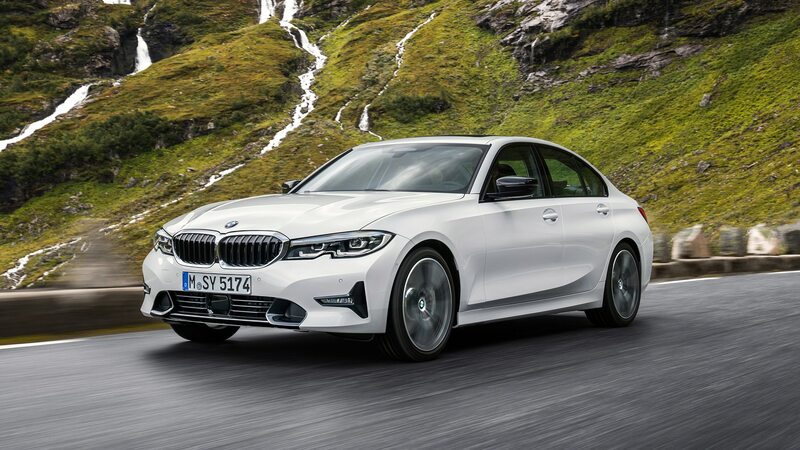 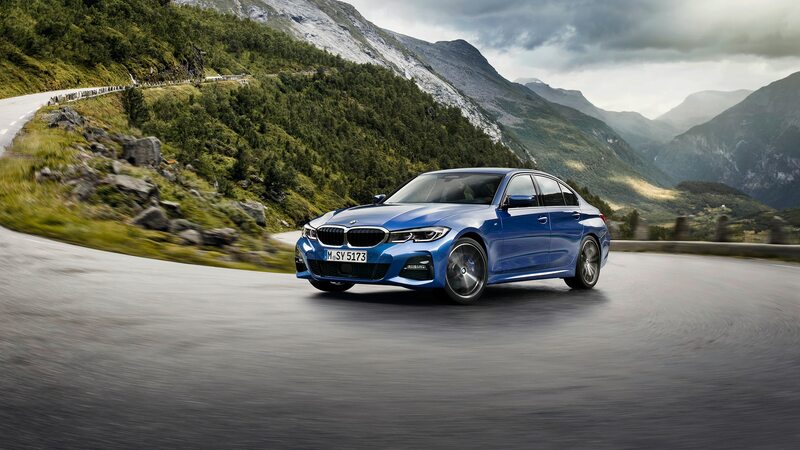 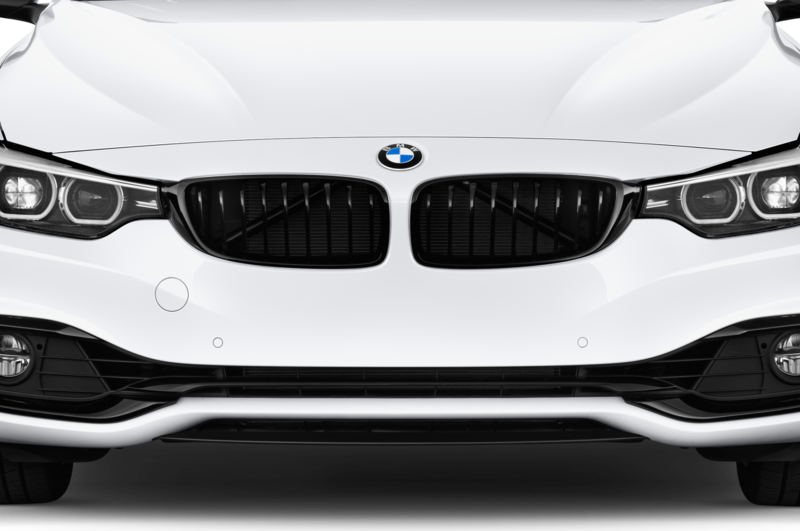 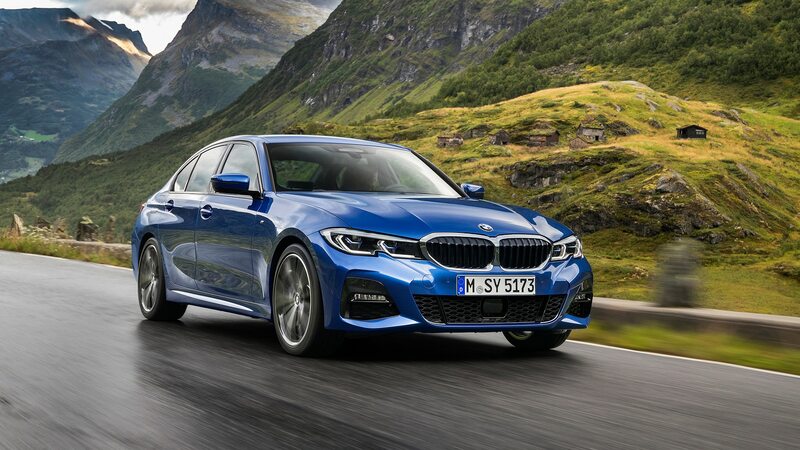 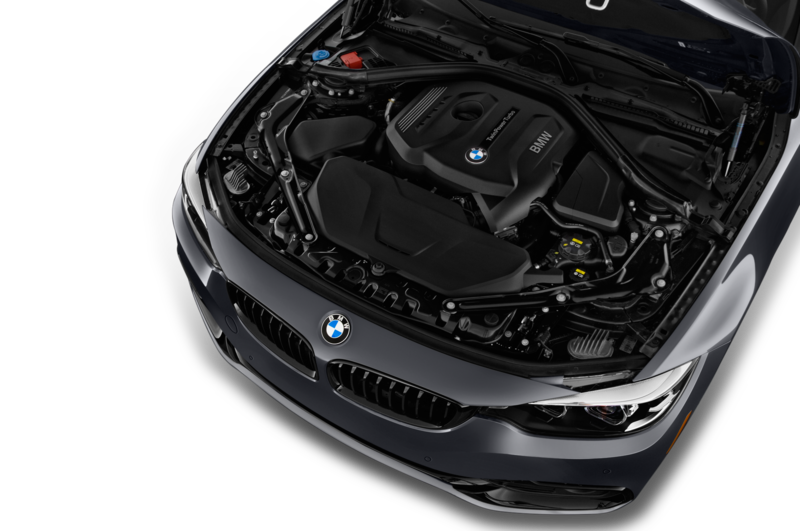 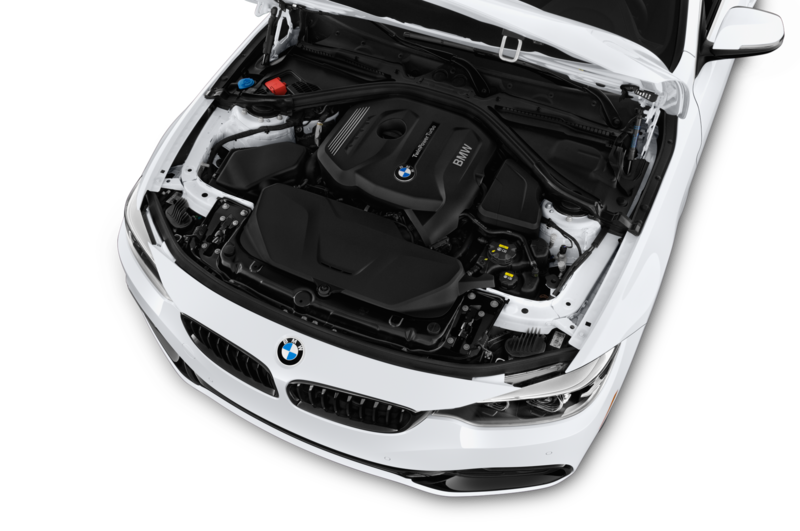 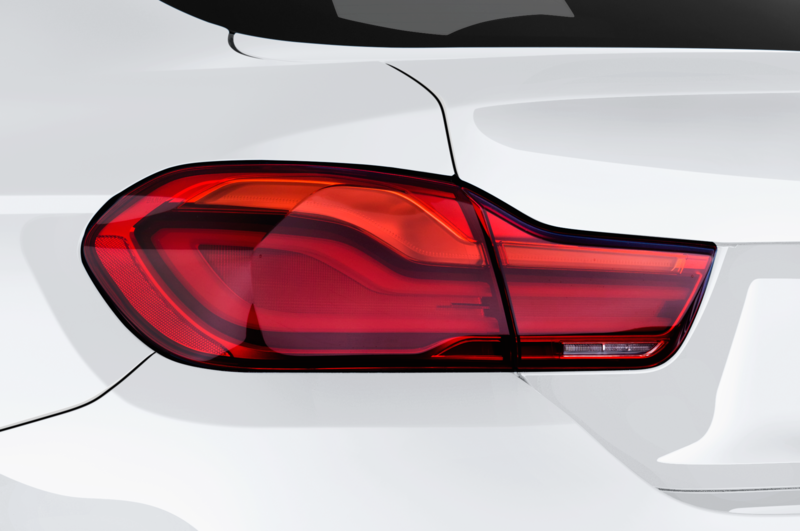 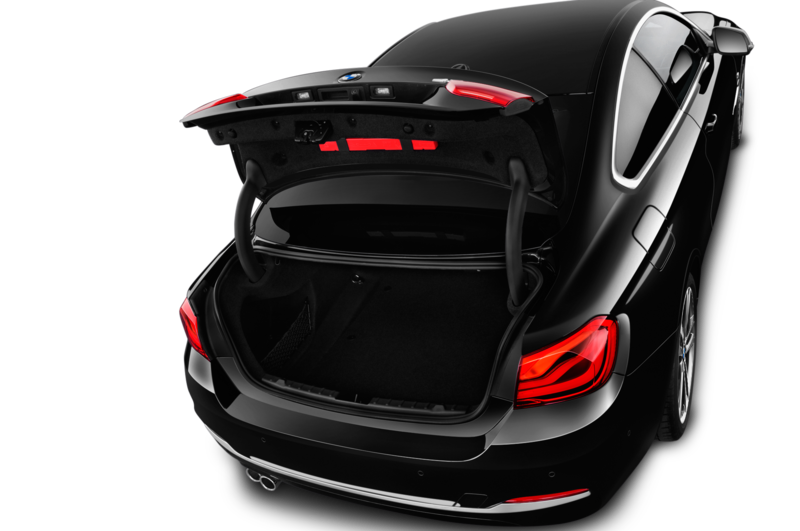 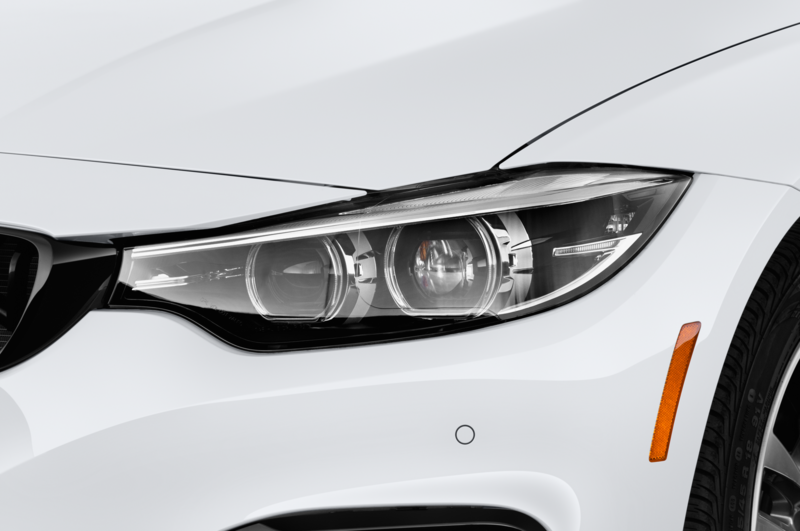 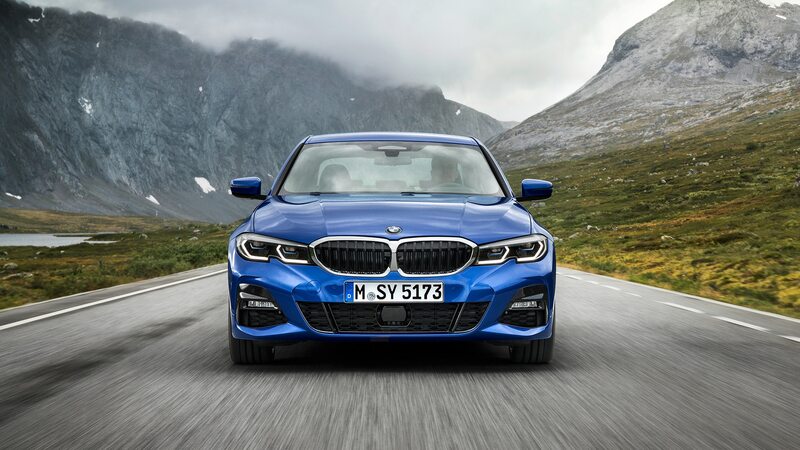 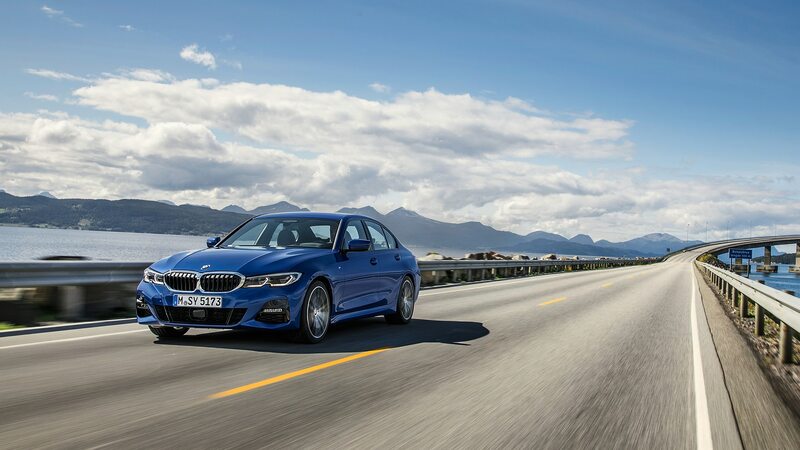 The Technik crew fitted BMW’s first multi-link suspension system in back and a 170-hp six-cylinder engine up front. 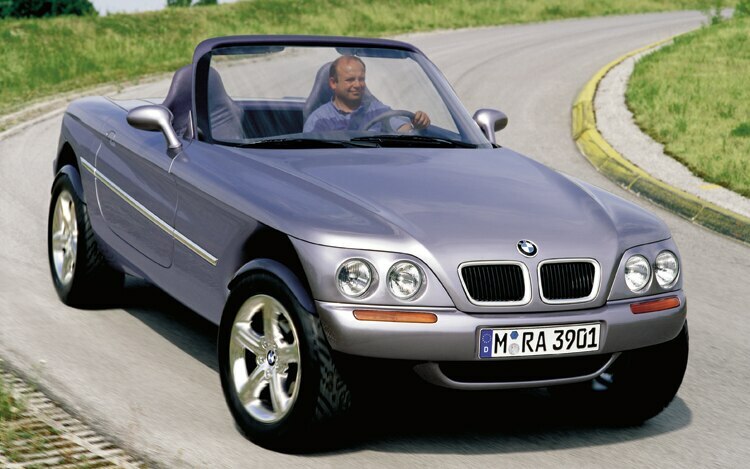 The Z1 so exceeded expectations that a production run was approved. 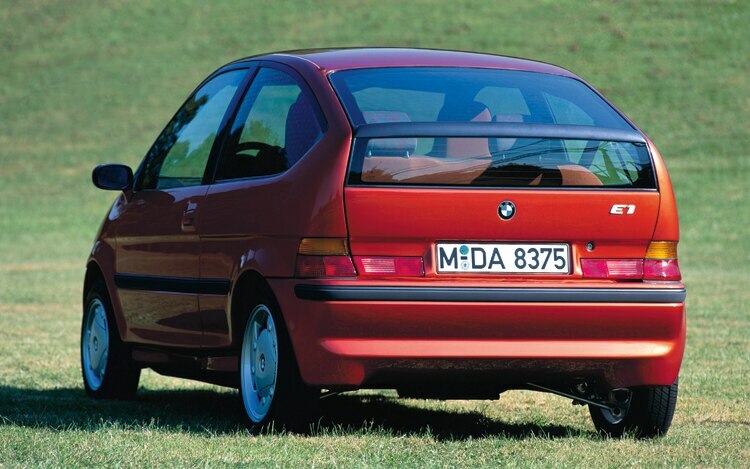 During the late 1980s, 8000 units were constructed in response to more than 30,000 orders for the car. 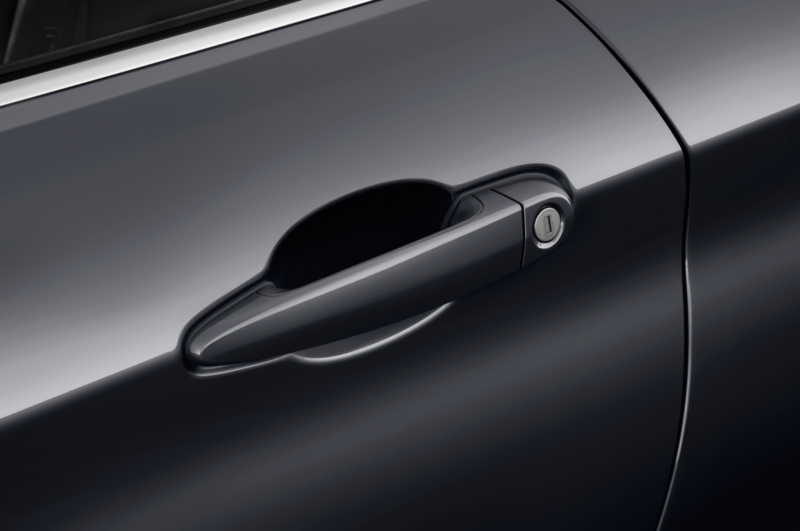 (None were imported because the vertically opening doors contradict our safety standards.) 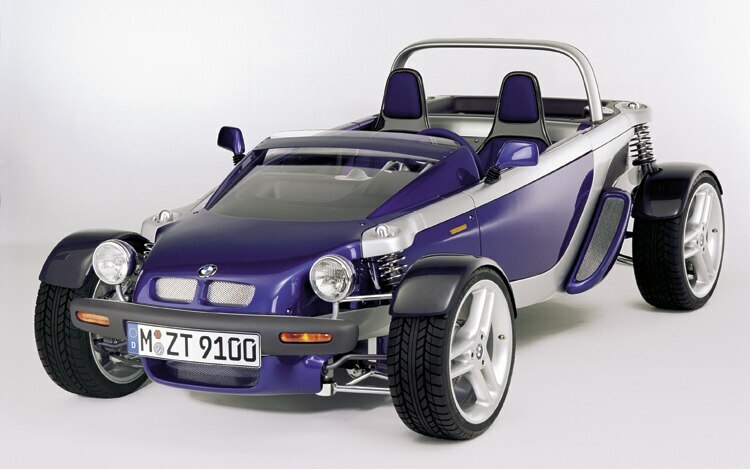 A Z1 coupe coded Z2 was designed and one static example was constructed using wood, clay, and plastic. 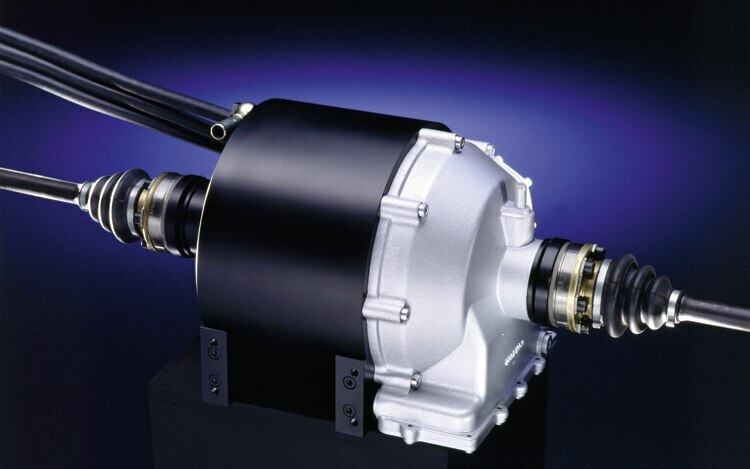 Follow-on versions called Z15 and E2 were slightly larger and powered by sodium-nickel-chloride batteries. 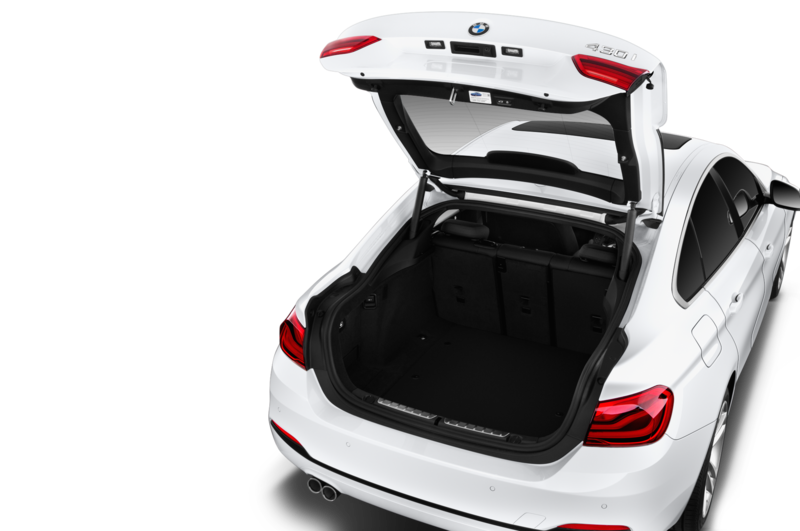 Z13 PACKAGING STUDY Is it feasible to pack a mid-size touring sedan’s room and safety within a compact car’s exterior dimensions? 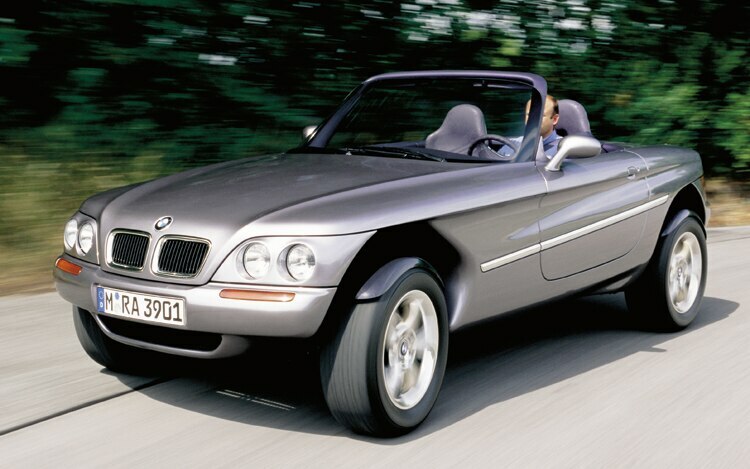 The BMW Z13 was built to find out. 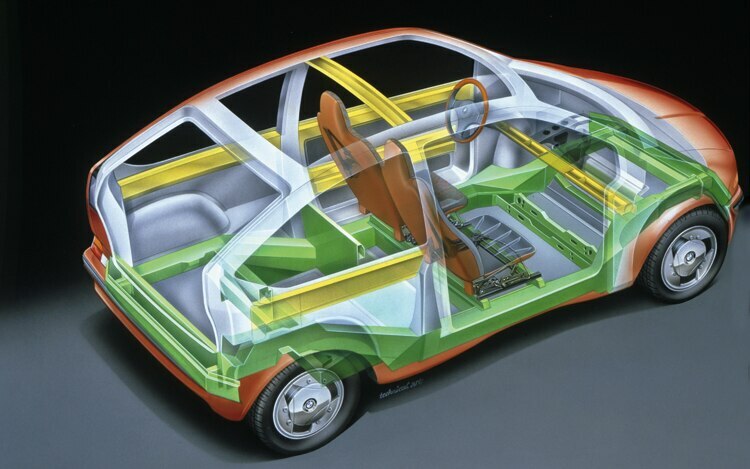 To save weight, the spaceframe underpinnings were constructed of aluminum extrusions and covered with plastic body panels. 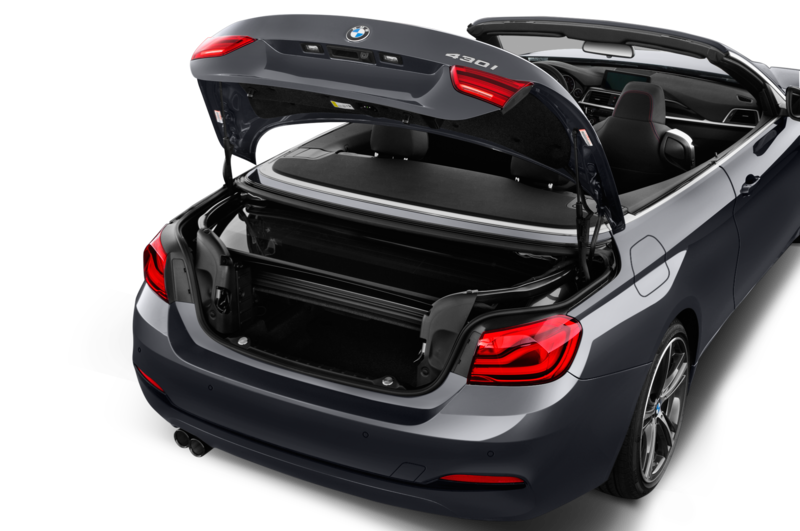 A compact 82-horsepower engine was packed in the rear. 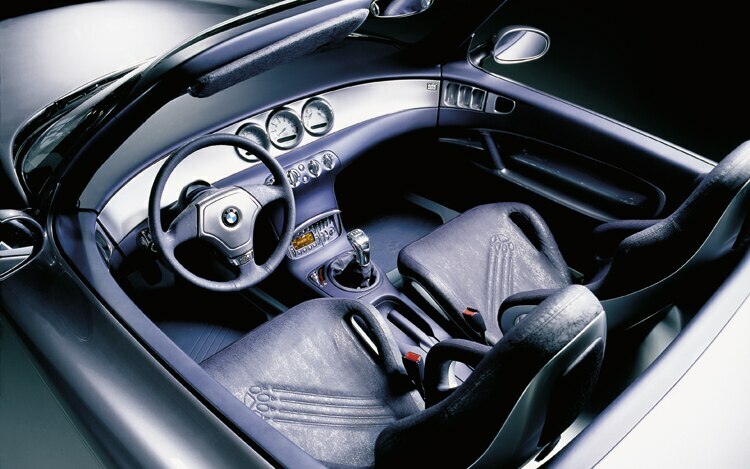 But the most unusual aspect of the Z13 was a central driver’s seat flanked by two fold-flat rear seats. 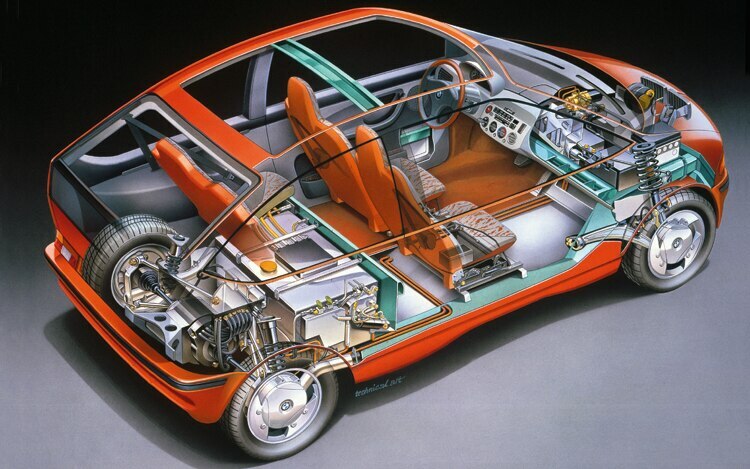 This 1830-pound buggy not only achieved 43 mpg, it also served as a handy telematics platform. 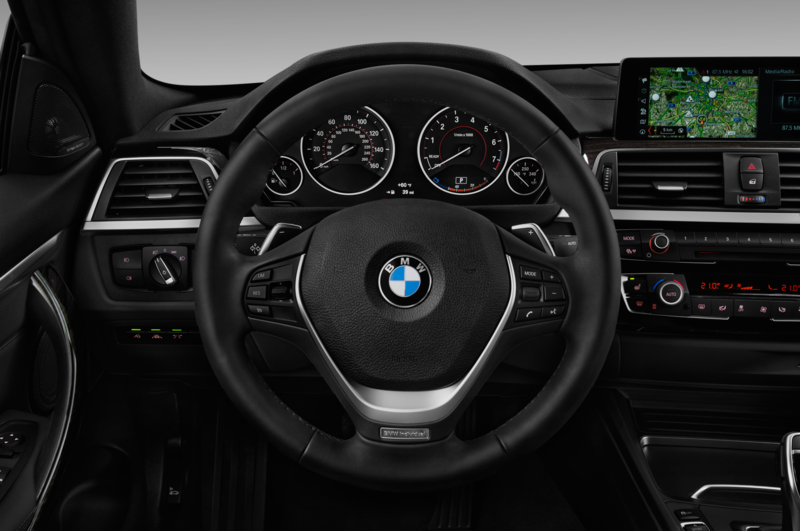 A GPS-based navigation system, a telephone, and a fax machine were fitted to its interior. 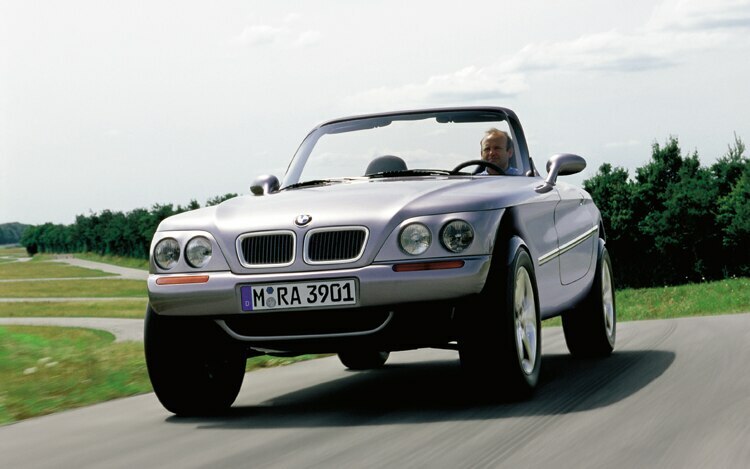 Z18 OFF ROADSTER BMW engineers feeling frisky in 1995 created a high-riding roadster with off-roading aspirations. 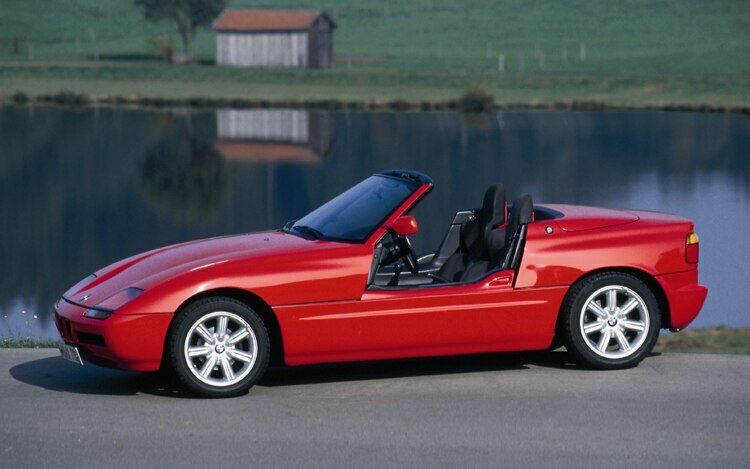 No slouch, the Z18 was powered by a 355-hp V-8 driving all the wheels. 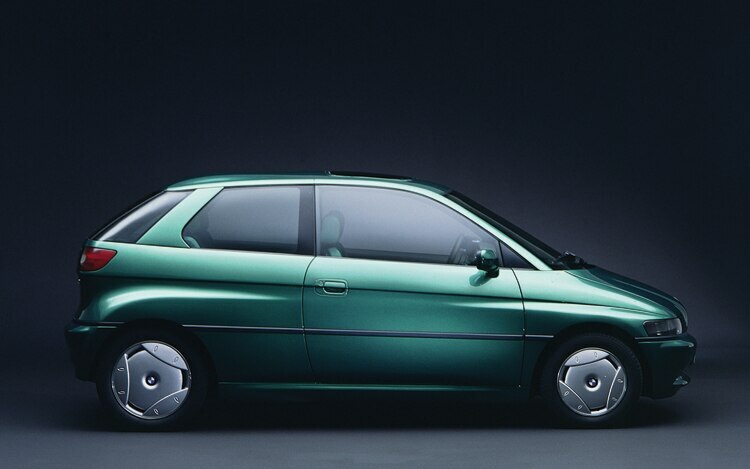 A steel frame was clad in plastic, as usual, and this experimental model was provided with limited fording capability. 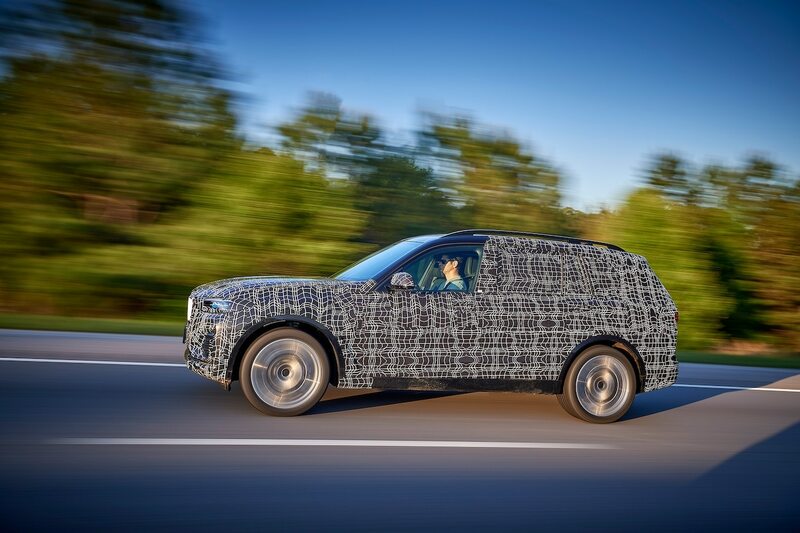 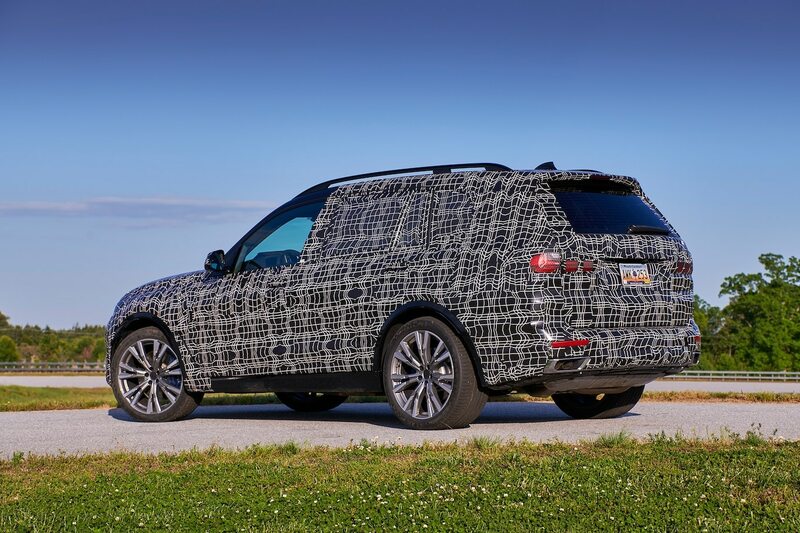 Two-seat, four-seat, and pickup configurations were all investigated. 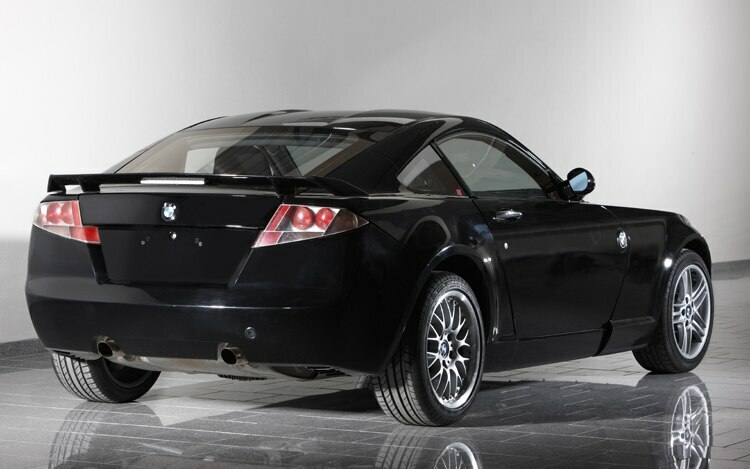 Z21 JUST 4/2 Practically every maker has toyed with four-wheel motorcycle concepts at one time or another. 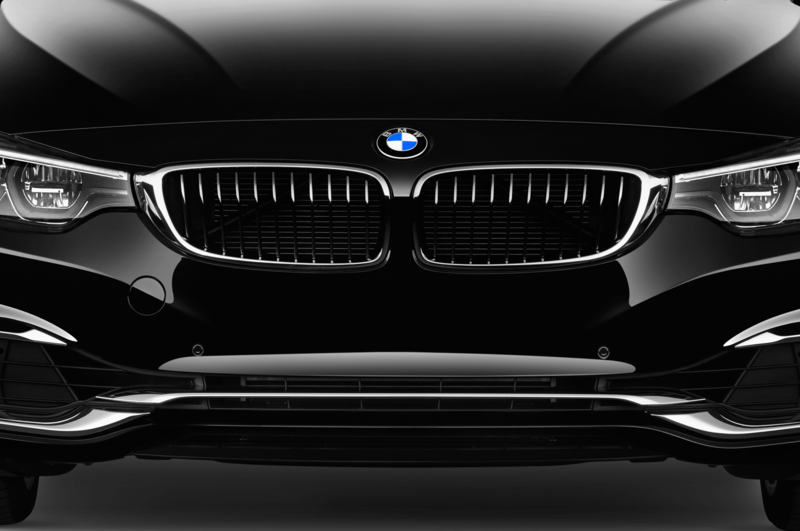 As a motorcycle manufacturer, BMW brought ample creative thinking to that notion. 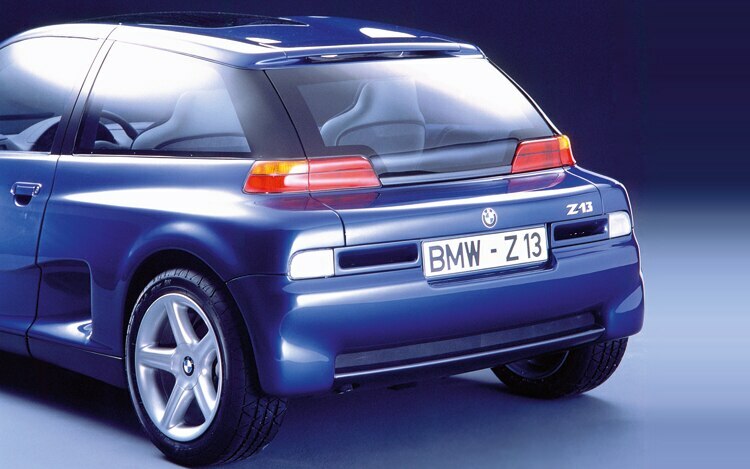 The Z21 wore a clever Just 4/2 nameplate when it bowed at the 1995 Tokyo Motor Show. 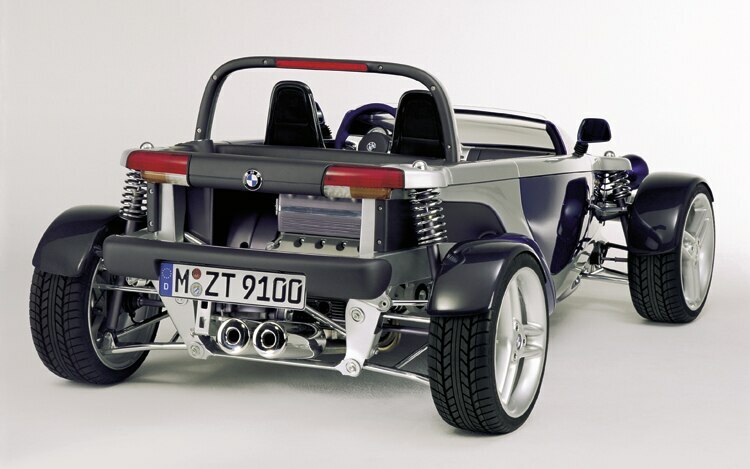 A four-cylinder engine transplanted from a K 1100 bike provided 100 horsepower, more than enough to propel the 1200-pound two-seater. 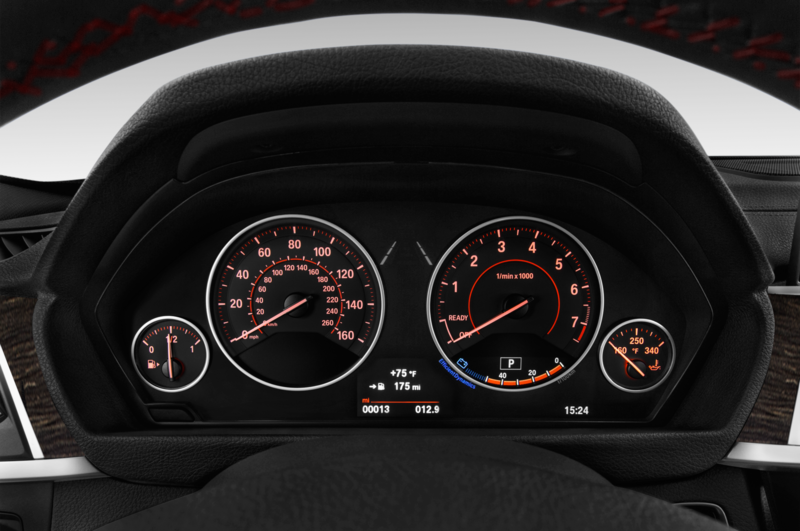 Six-second 0-60 acceleration and a 112-mph top speed were claimed. 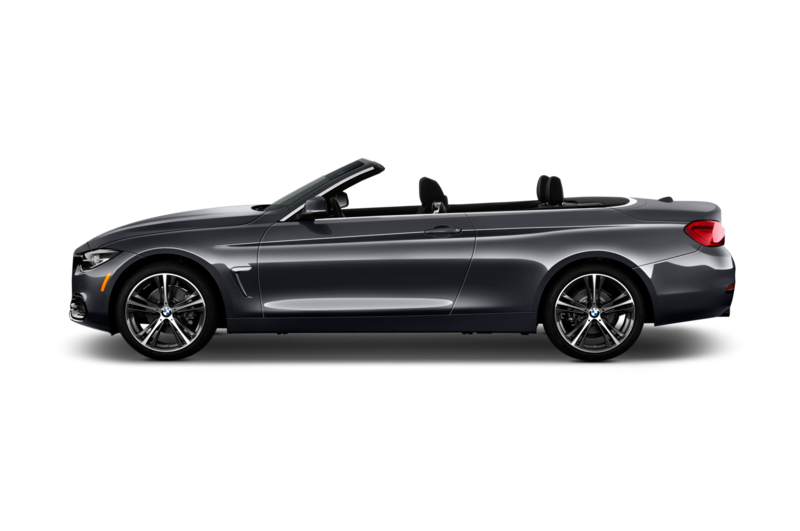 Special attire was designed for the attractive models that presented this one-off BMW in Japan. 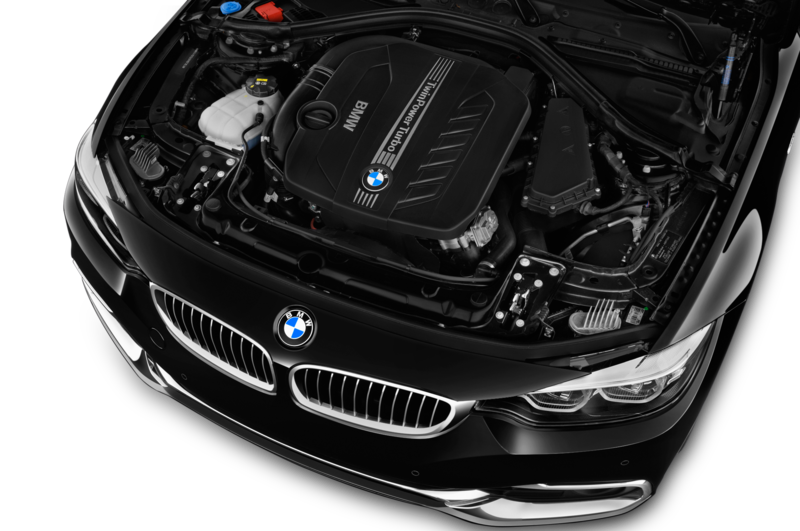 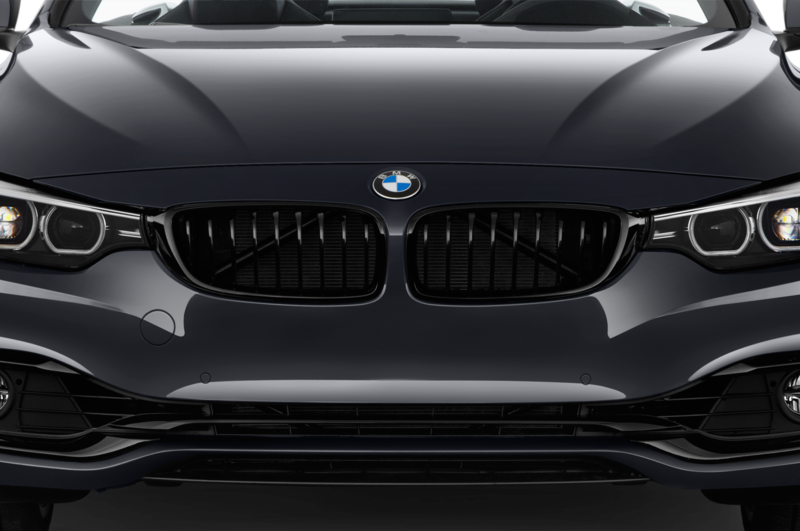 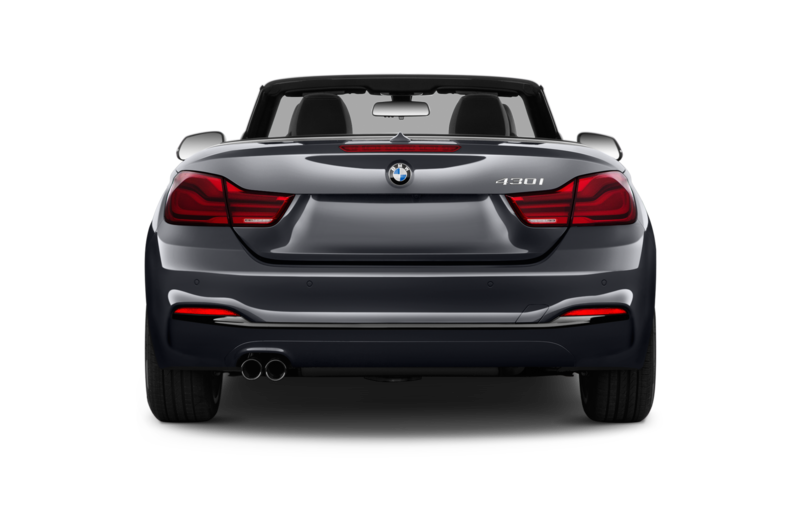 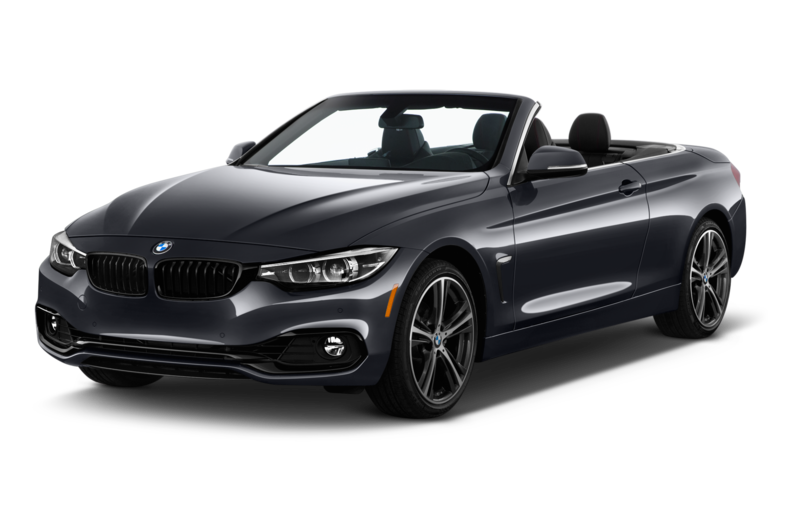 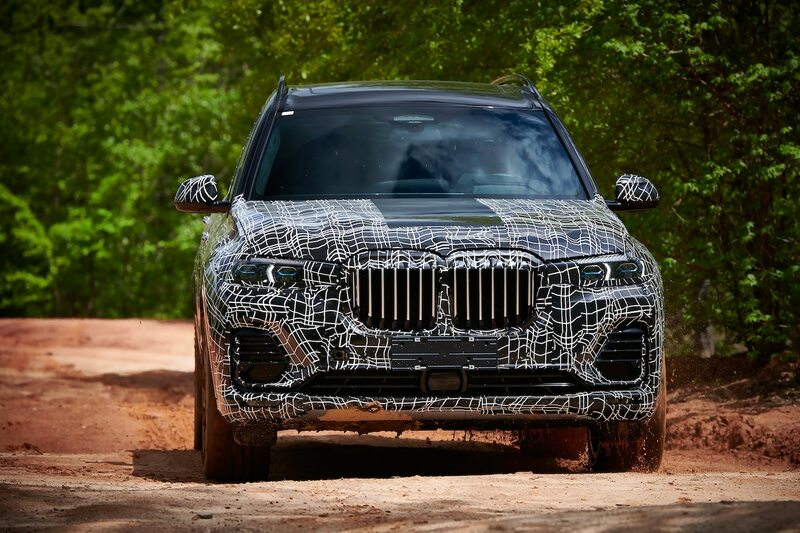 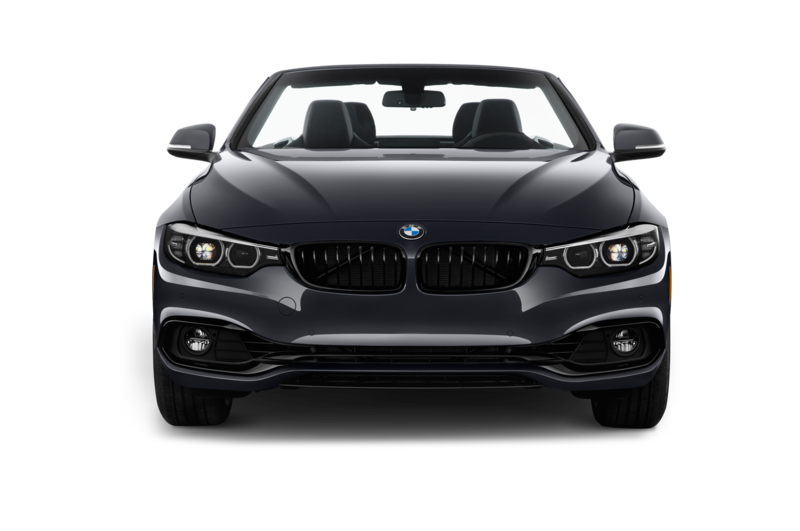 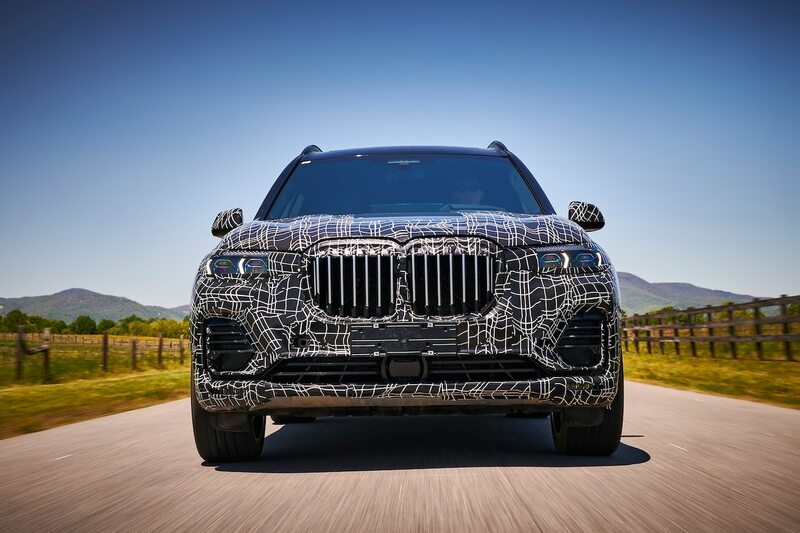 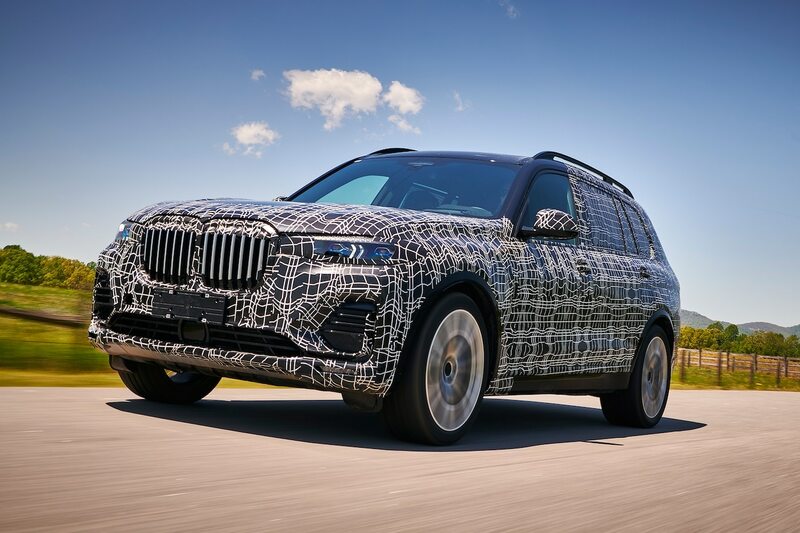 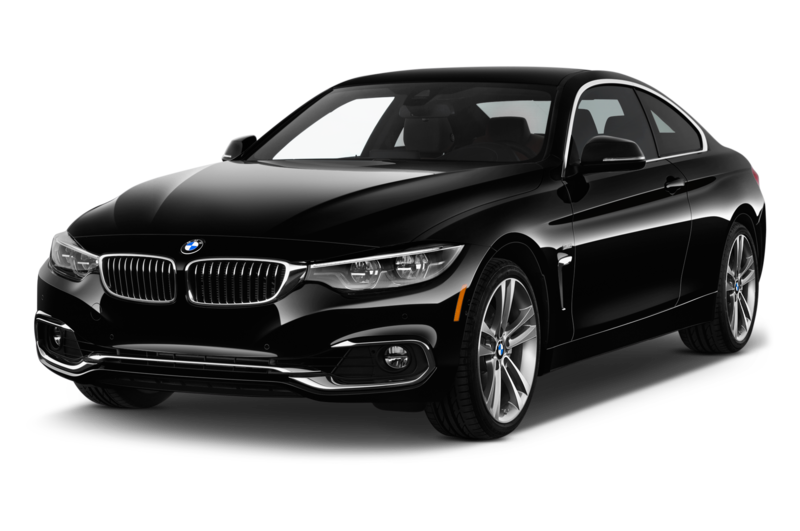 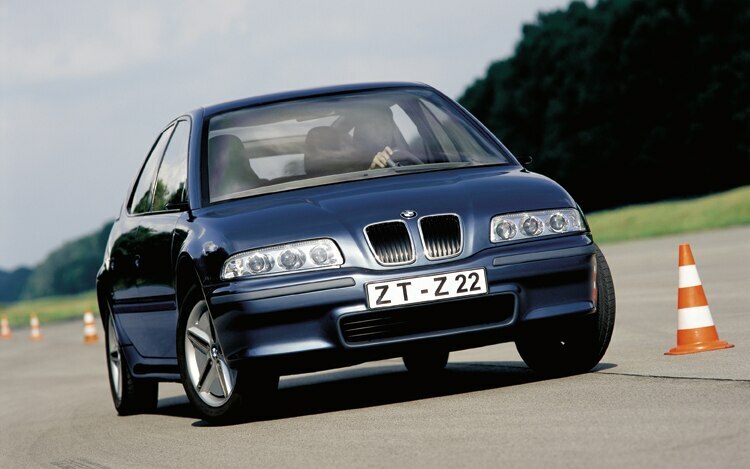 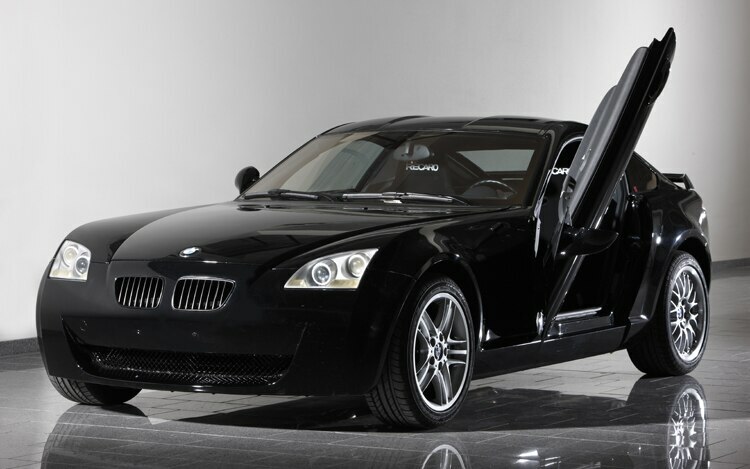 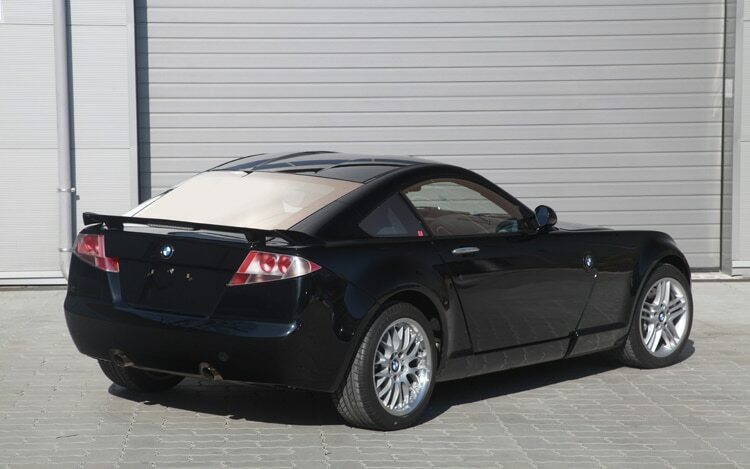 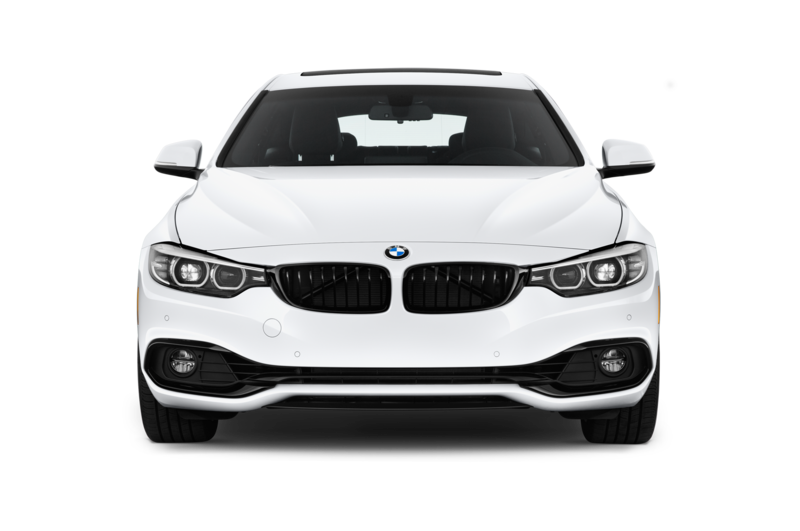 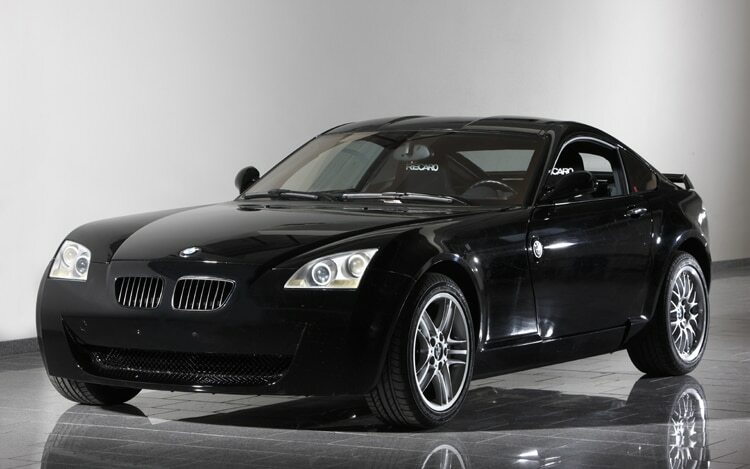 Z22 MECHATRONIC SPECIAL BMW calls the marriage of electronic controls and mechanical systems ‘mechatronics.’ In 1999, the Z22 was created with 70 innovations and 61 inventions to investigate this emerging technology. 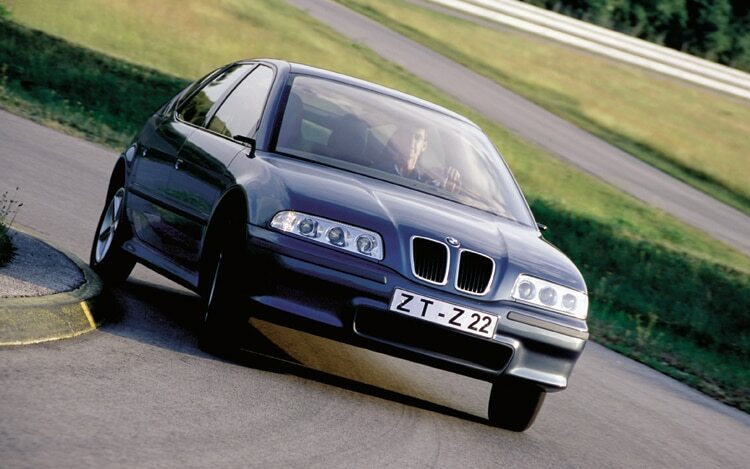 The Z22 is the most ambitious exercise in BMW’s project car history. 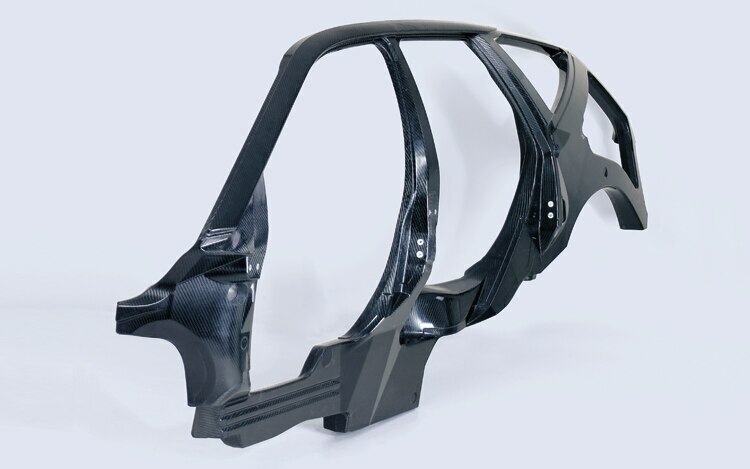 A carbon-fiber monocoque chassis saved significant weight. 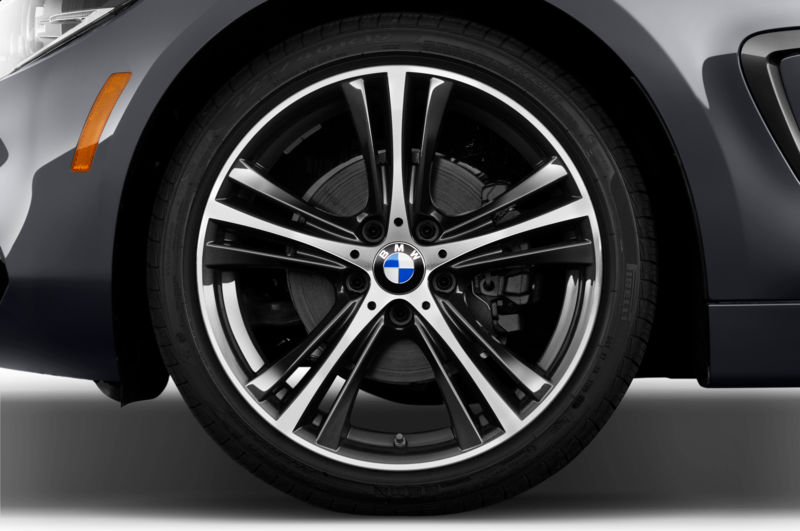 By-wire systems controlled both steering and braking functions. 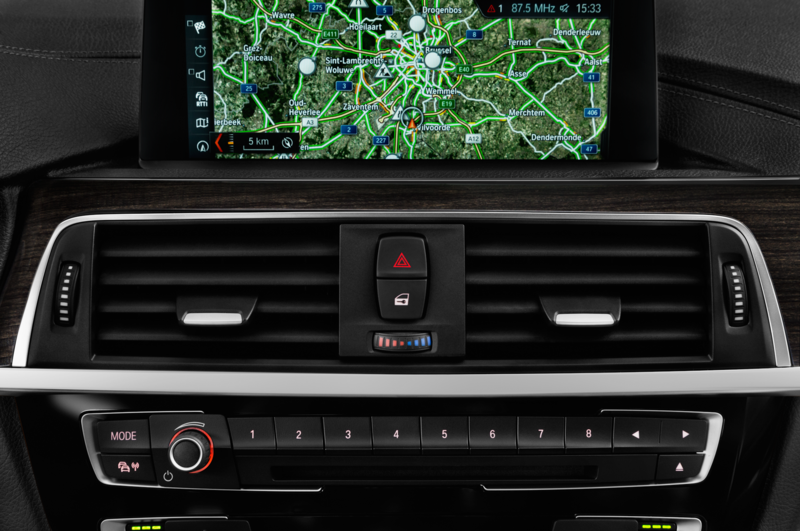 In lieu of ordinary rear-view mirrors, cameras sent images to a central display screen. 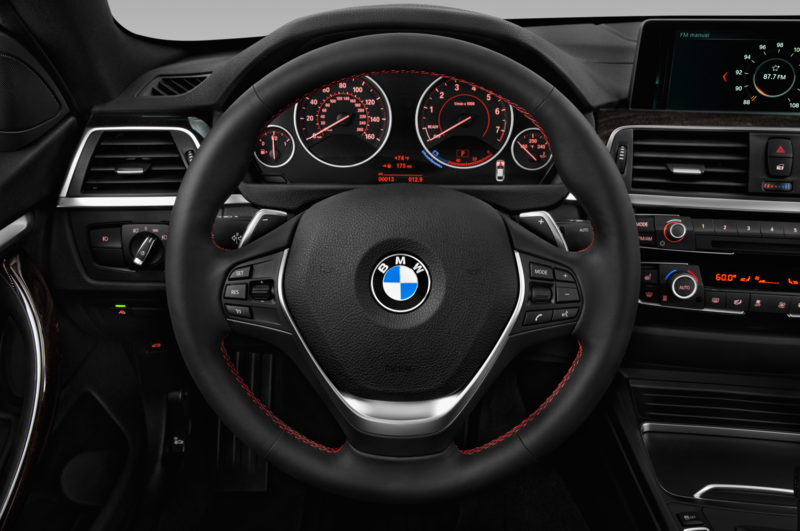 Replacing the ignition lock, there is a fingerprint scanning device. 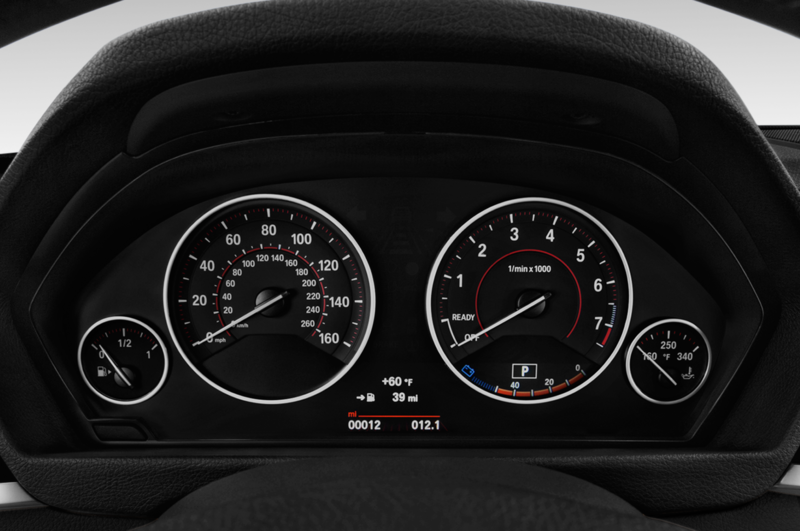 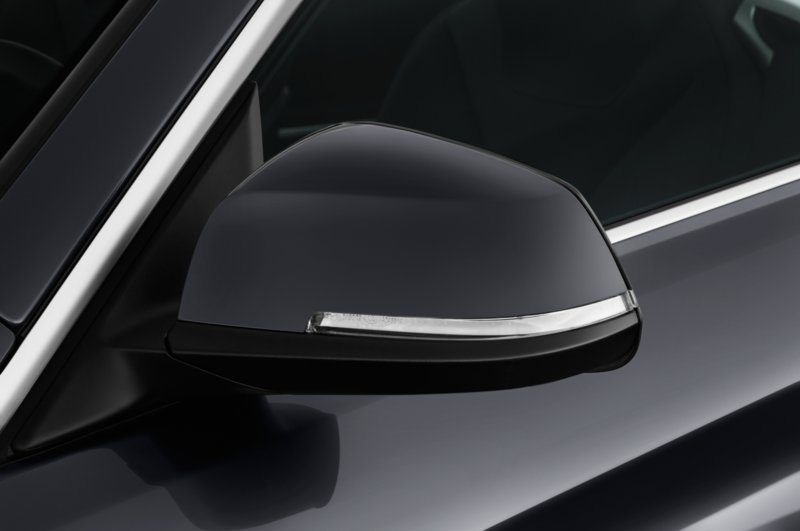 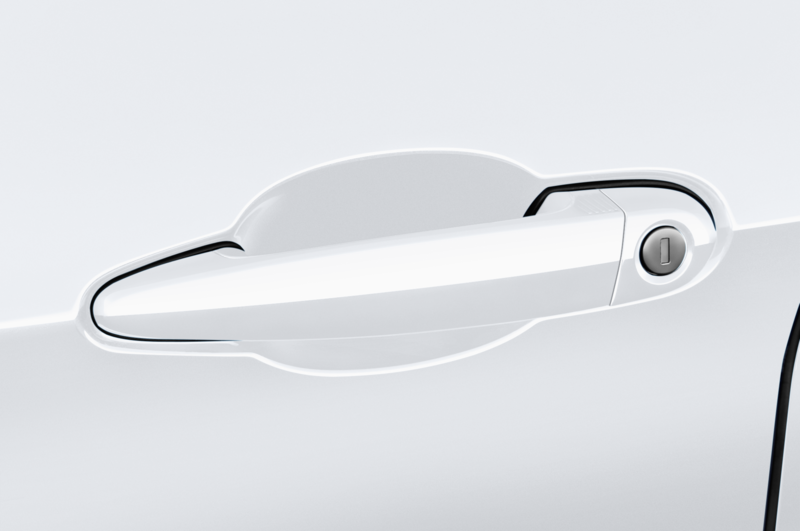 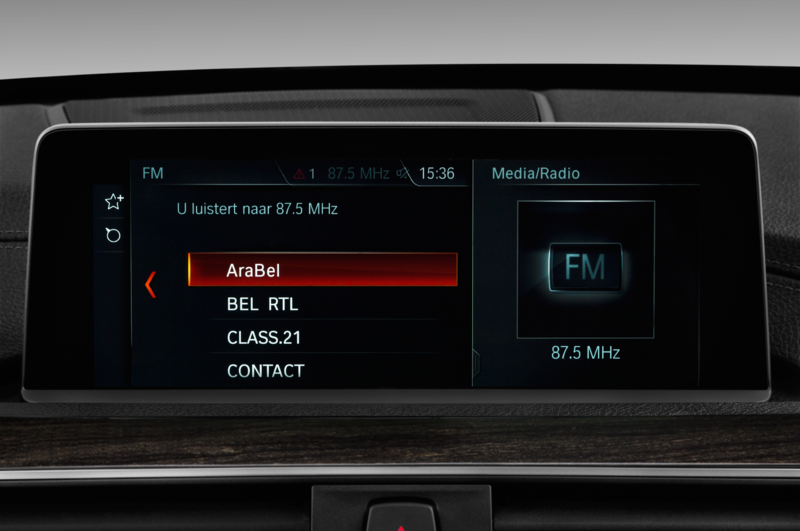 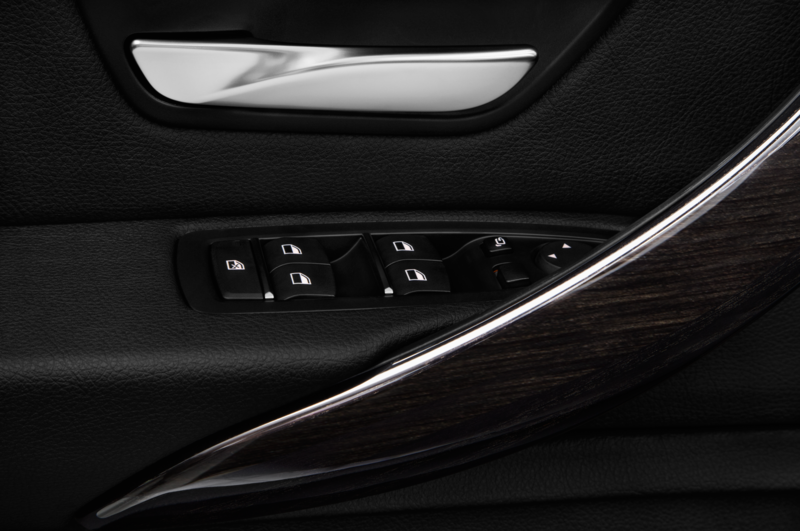 Instead of a round steering wheel, a rectangular guidance control unit is fitted for a better view of the two-dial cluster and the head-up display. 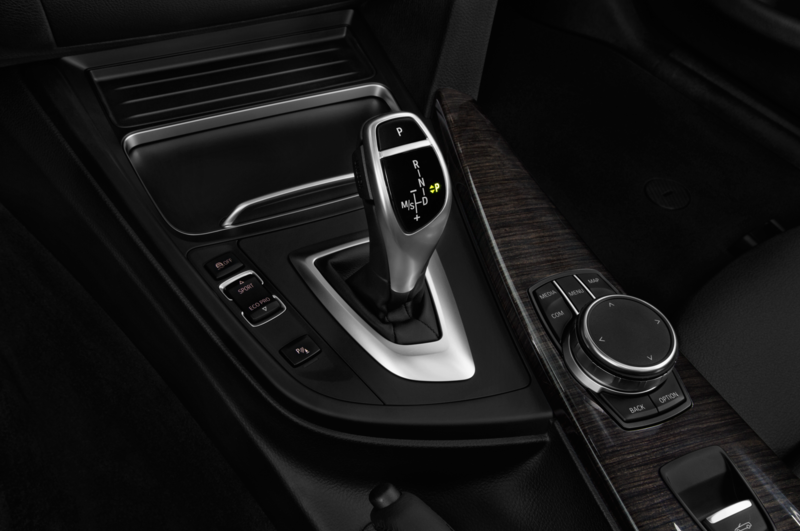 A rotary switch governs the CVT which connects a 136-horsepower flat four-cylinder engine to the rear wheels. 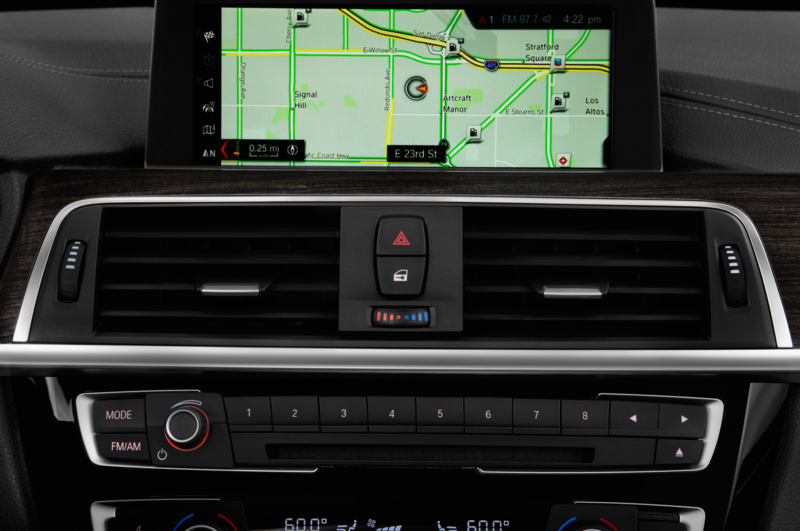 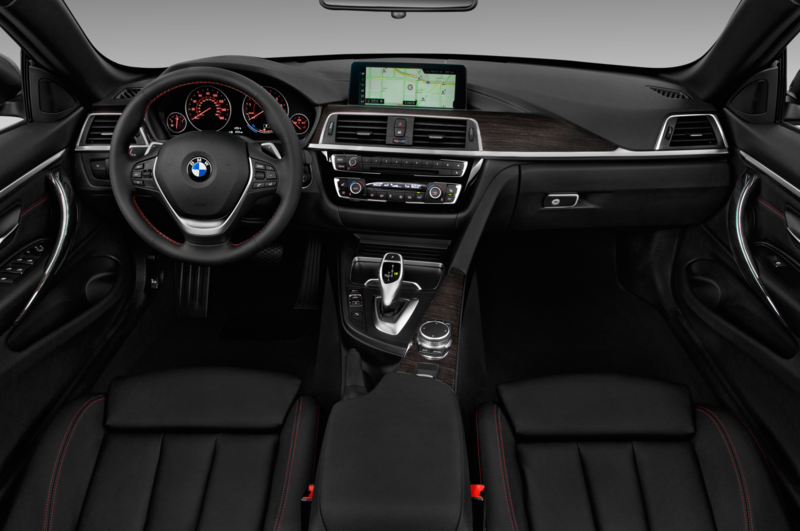 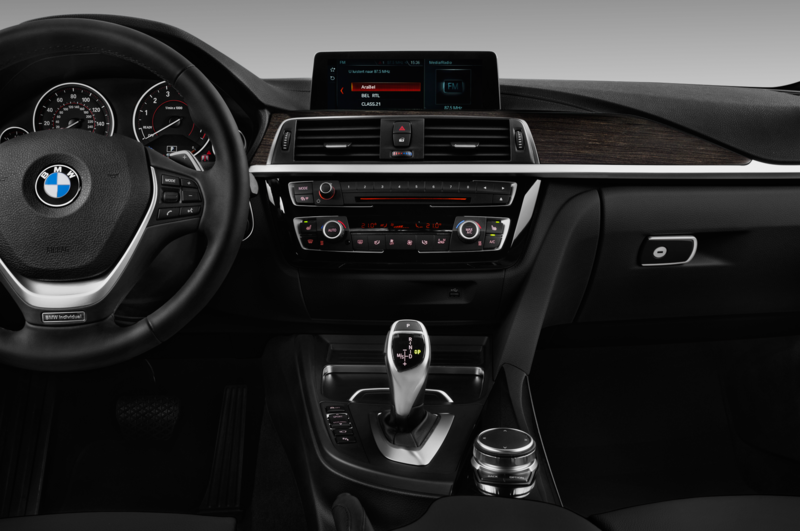 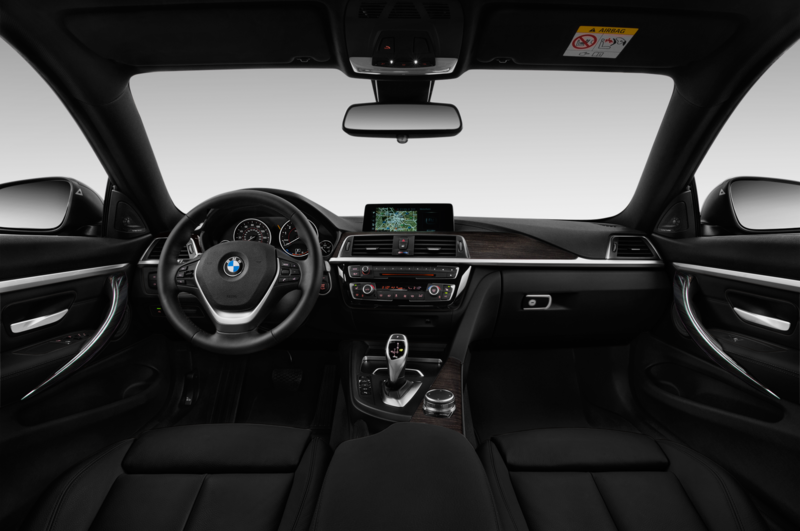 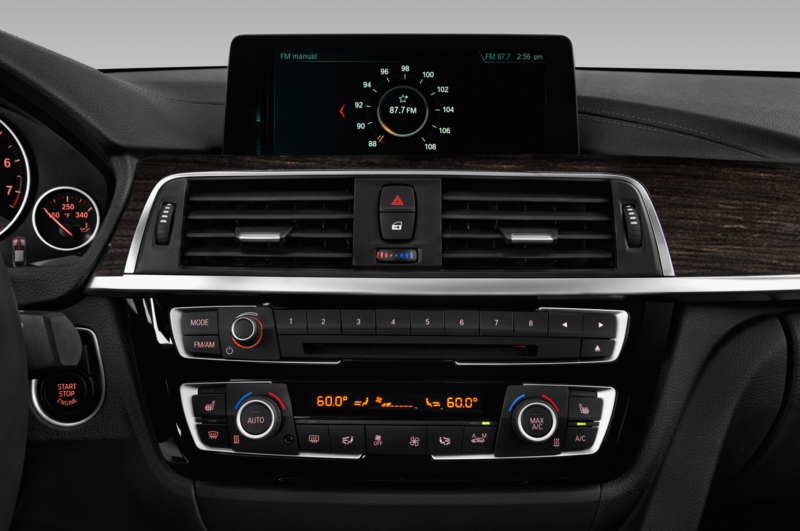 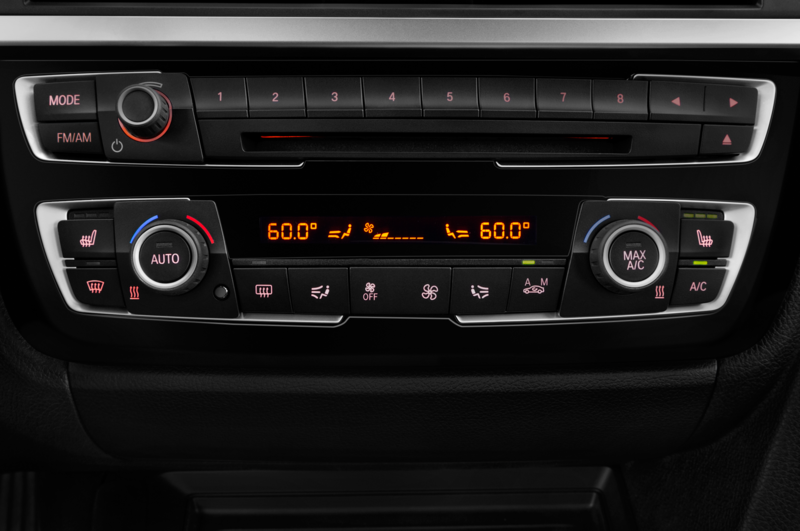 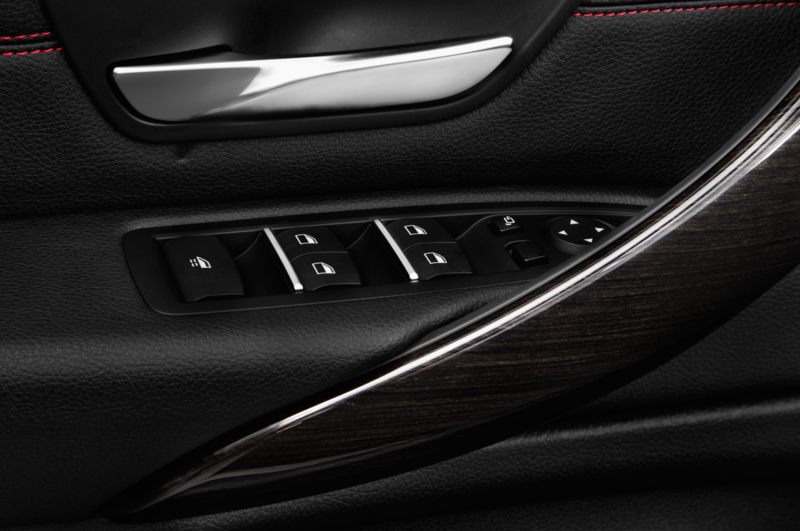 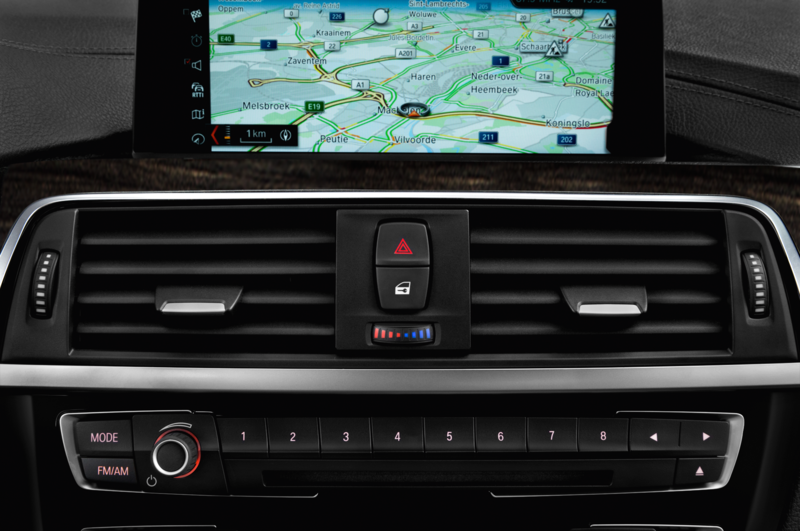 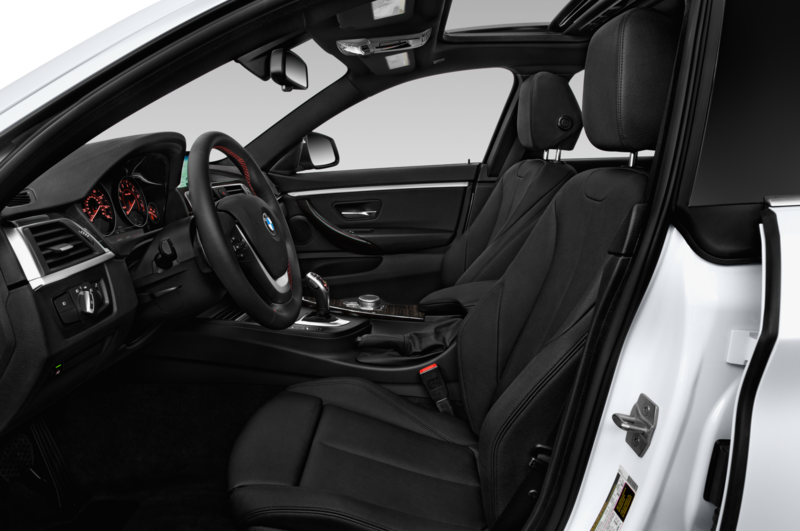 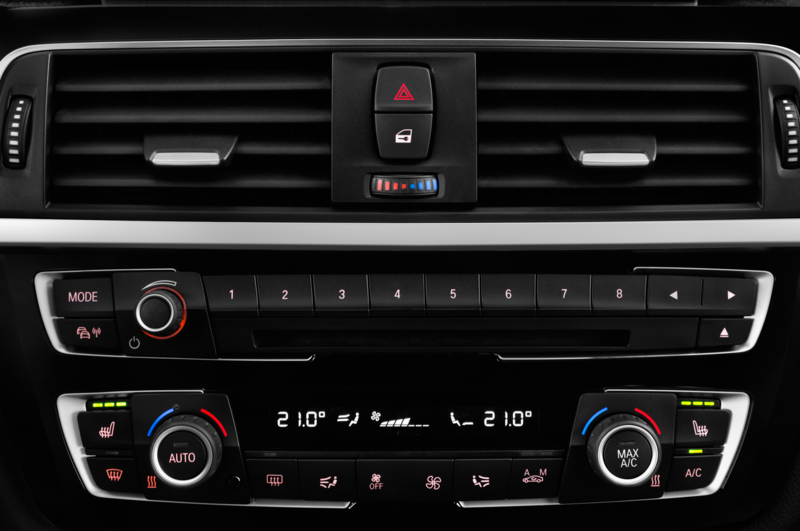 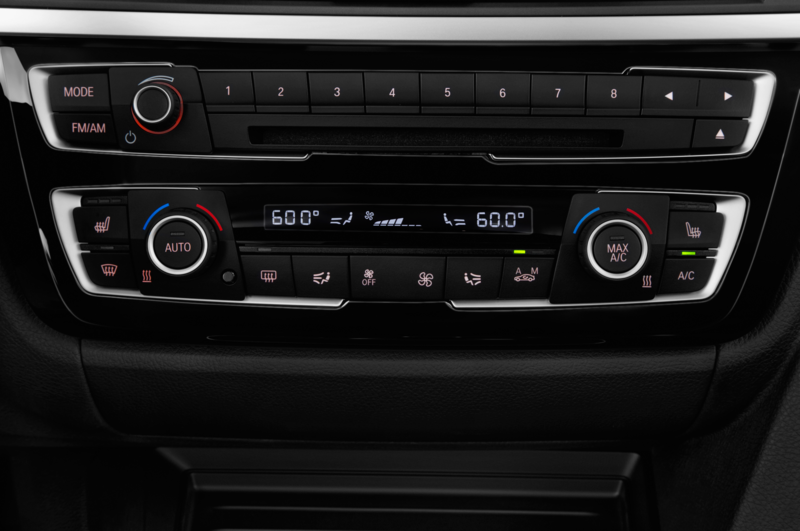 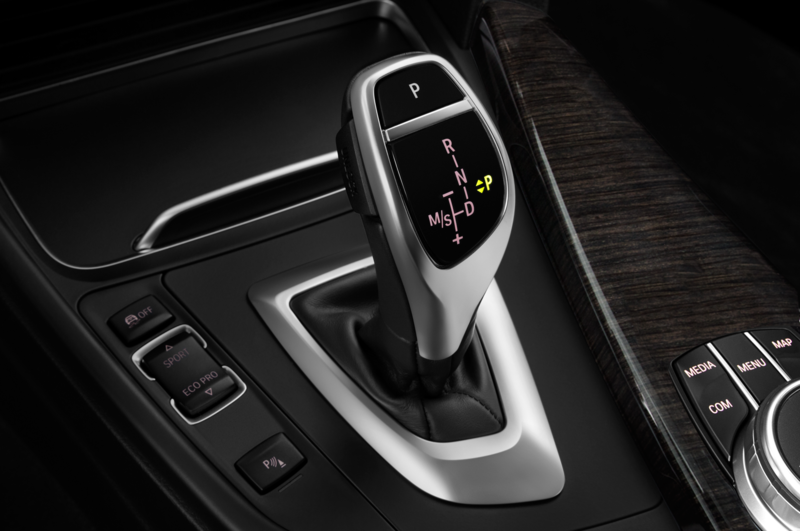 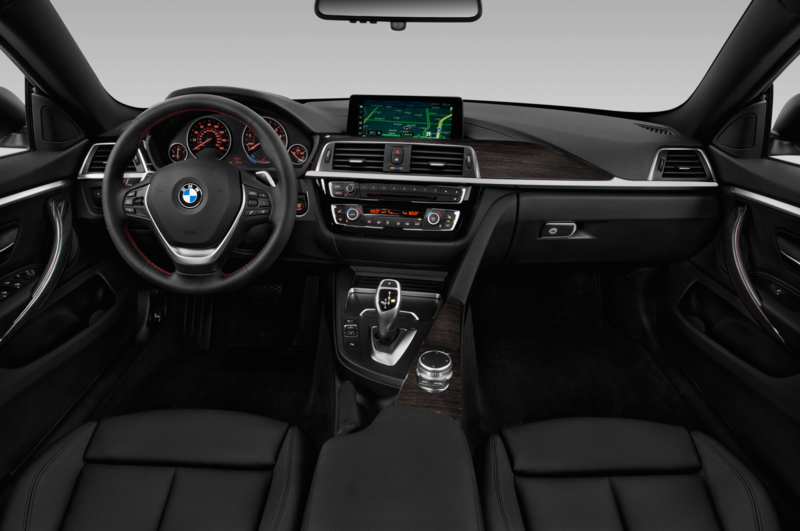 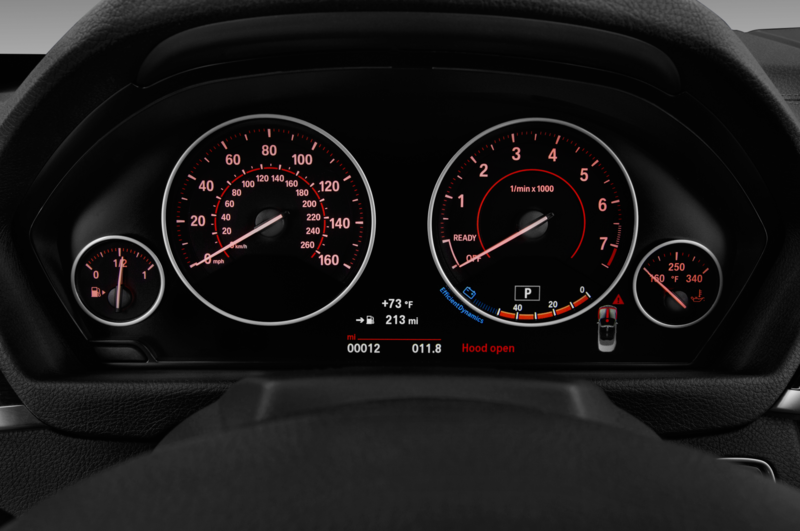 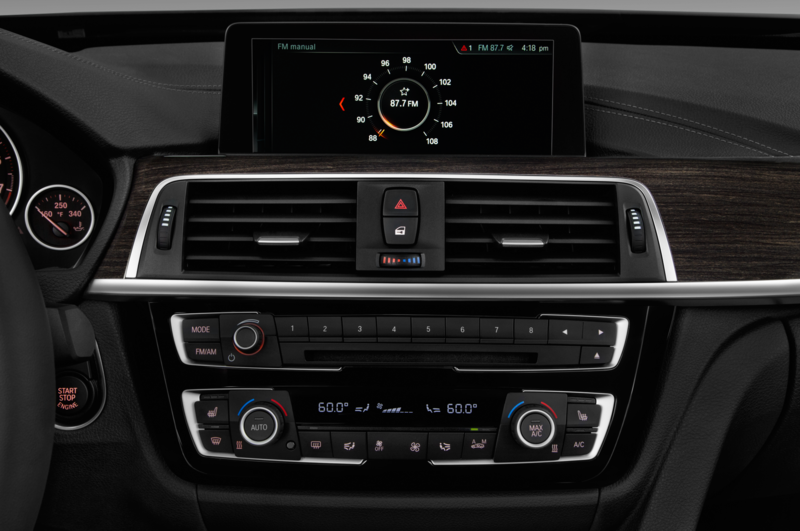 The Z22 also pioneered BMW’s I-Drive mouse controller for various infotainment, comfort, powertrain, and chassis systems. 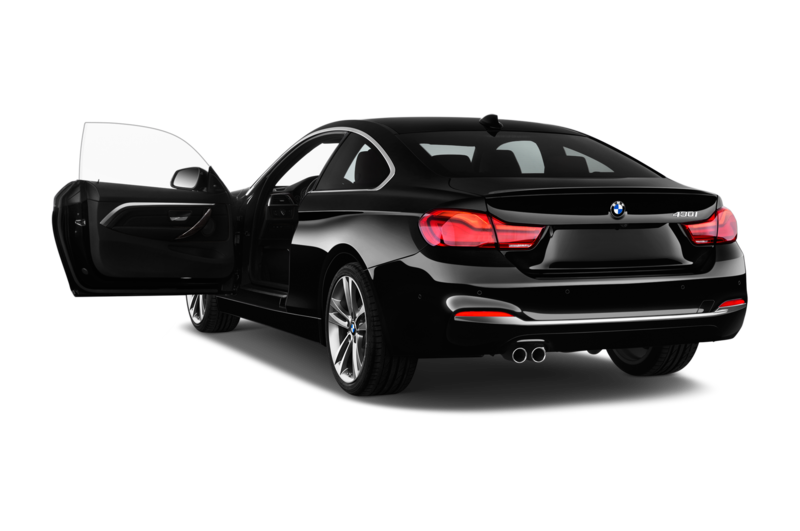 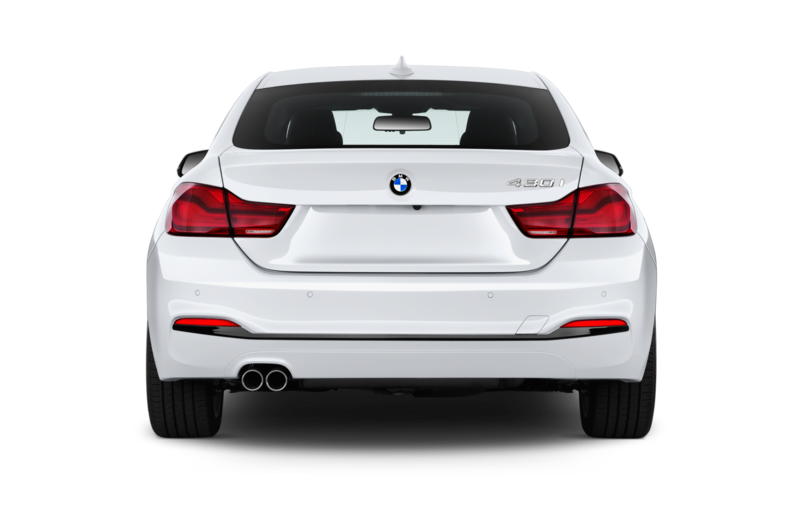 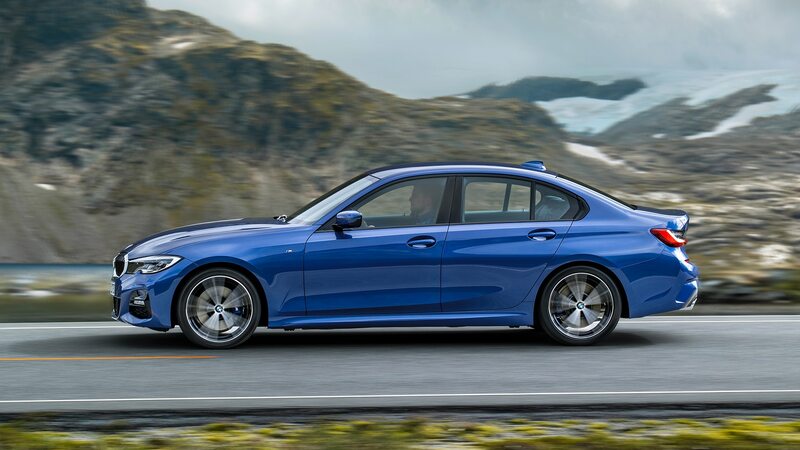 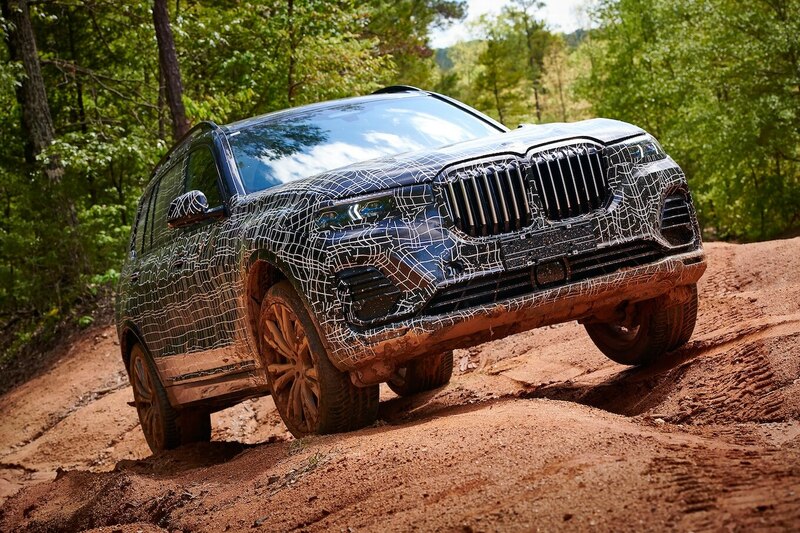 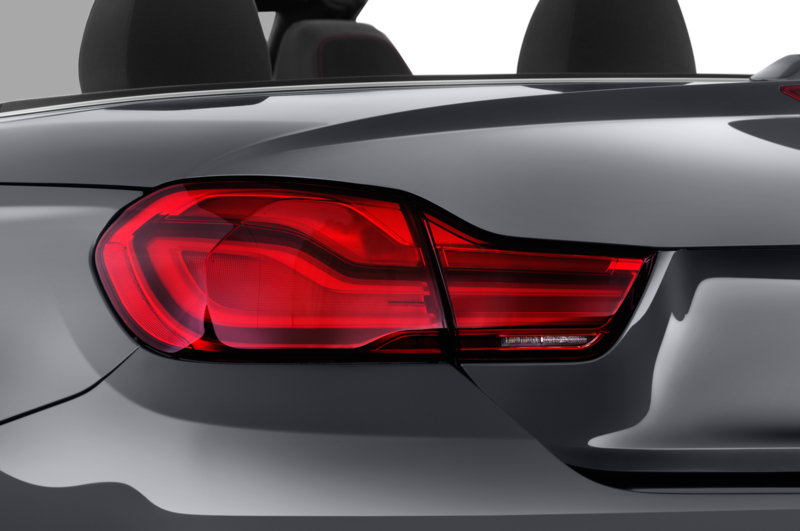 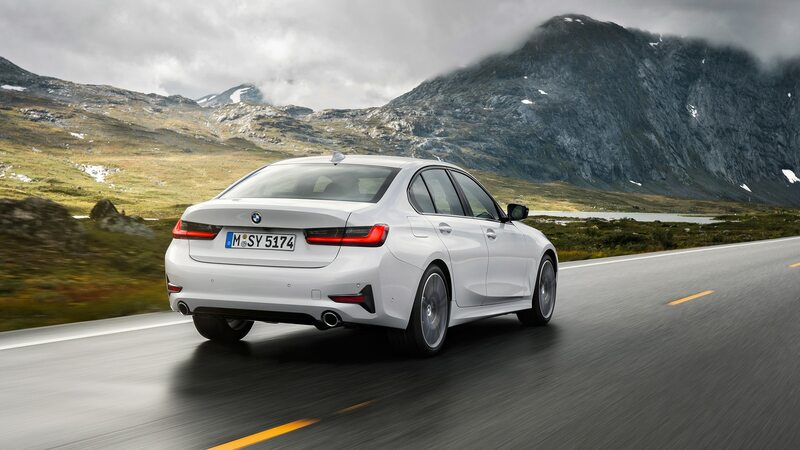 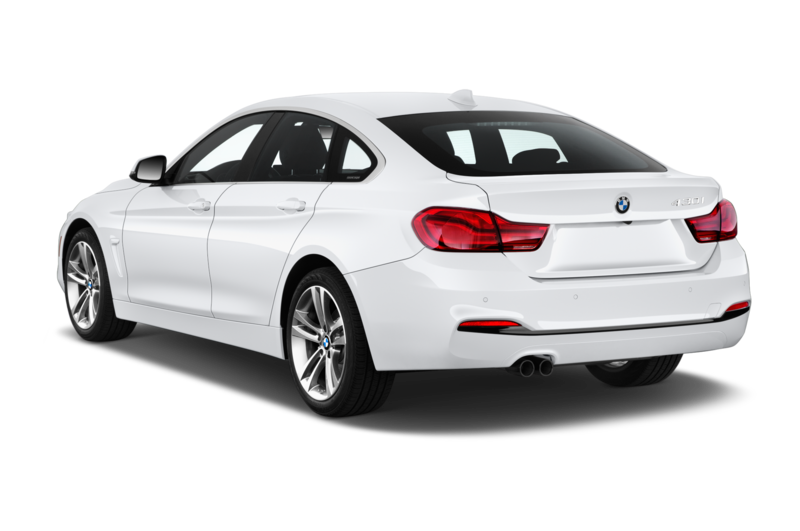 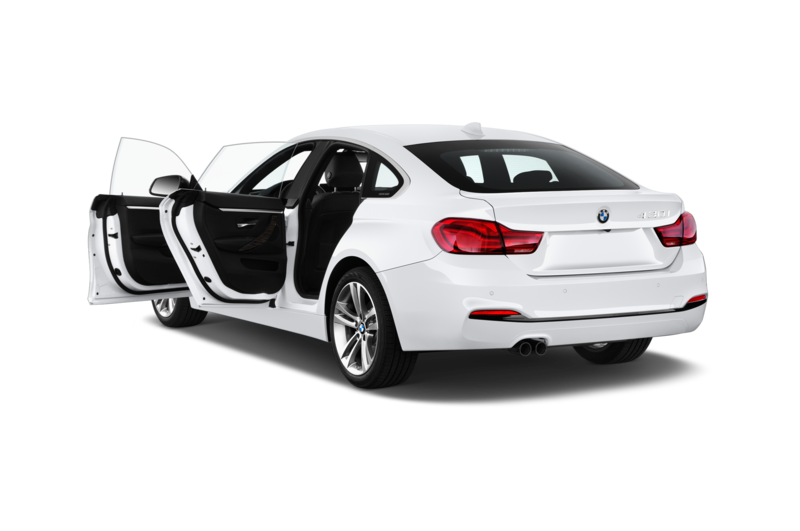 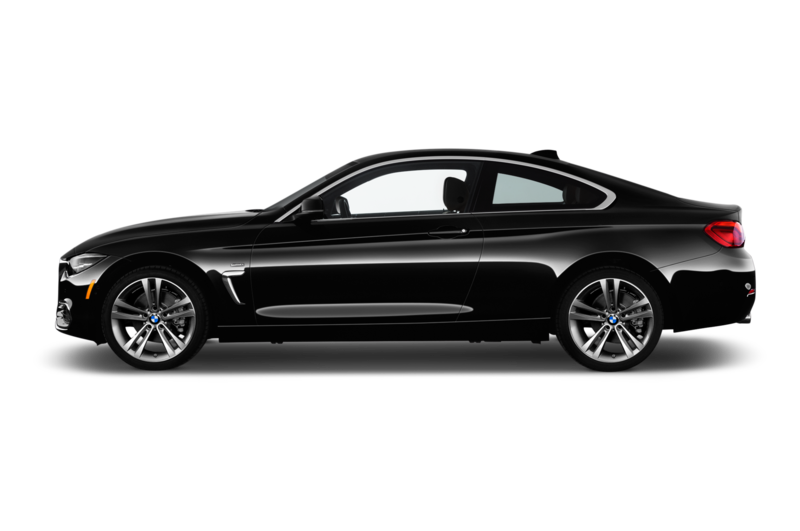 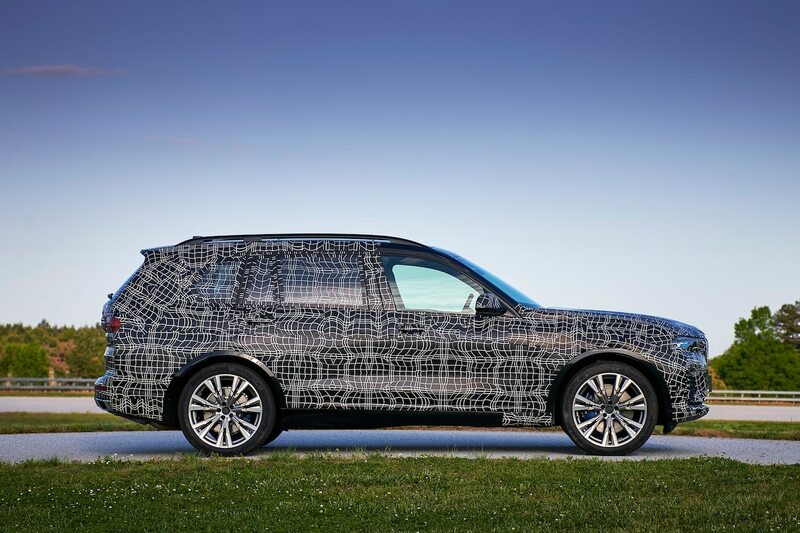 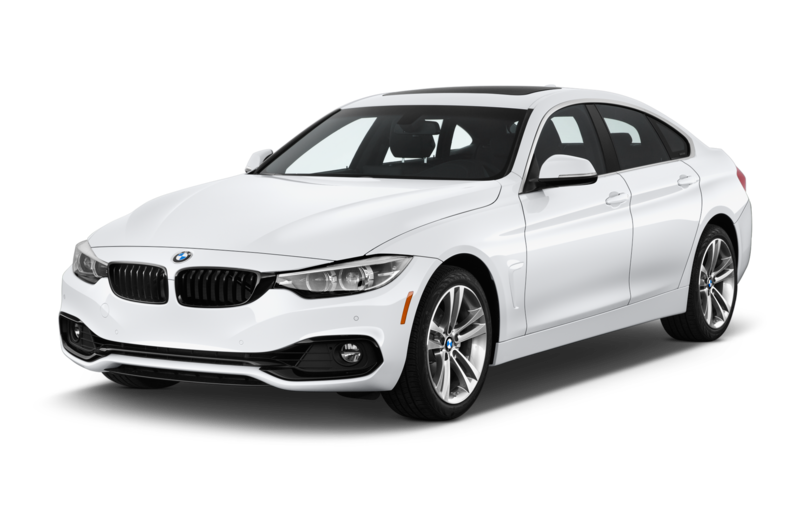 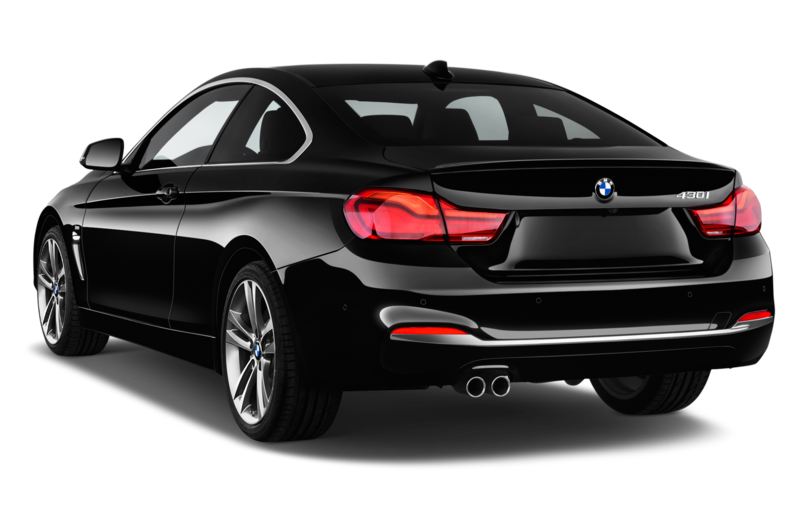 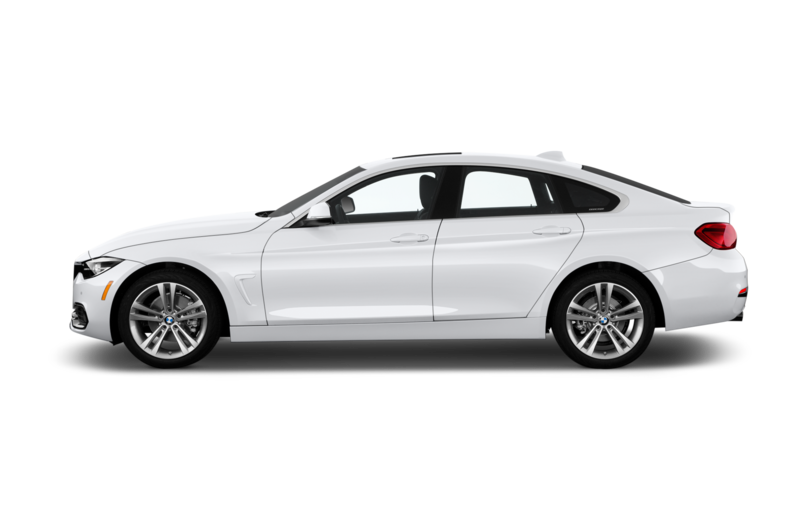 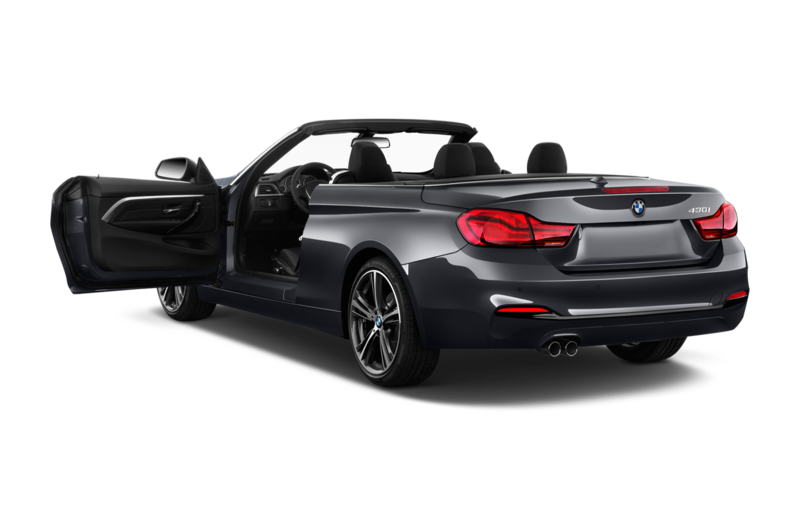 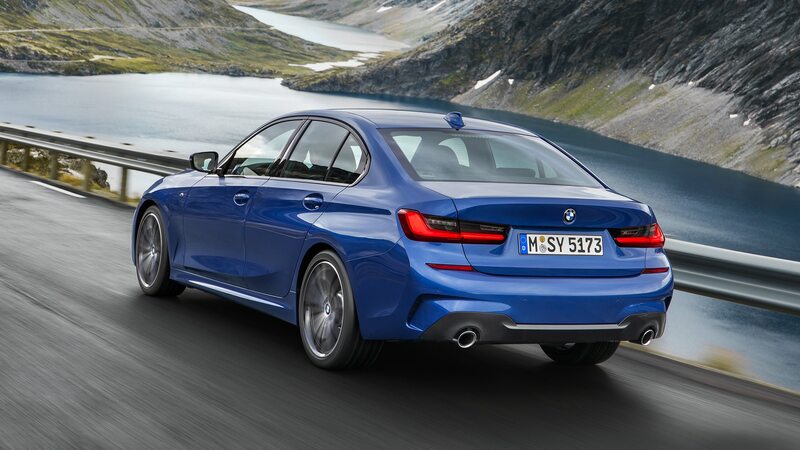 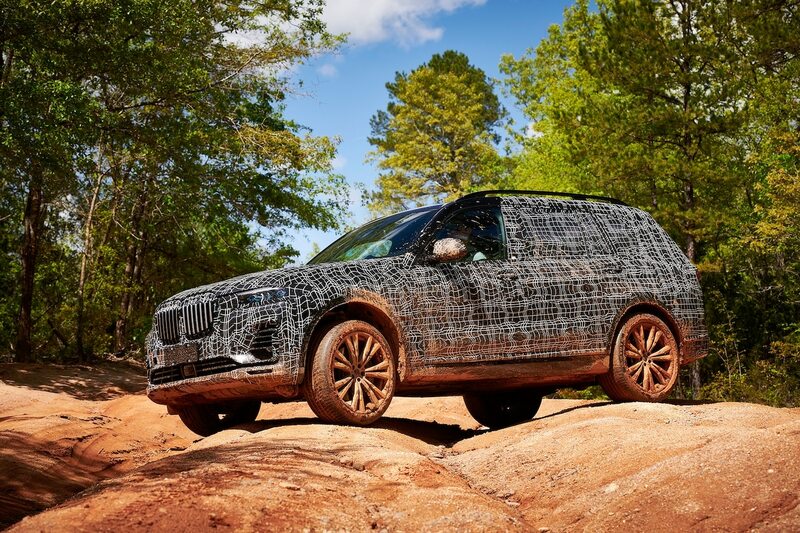 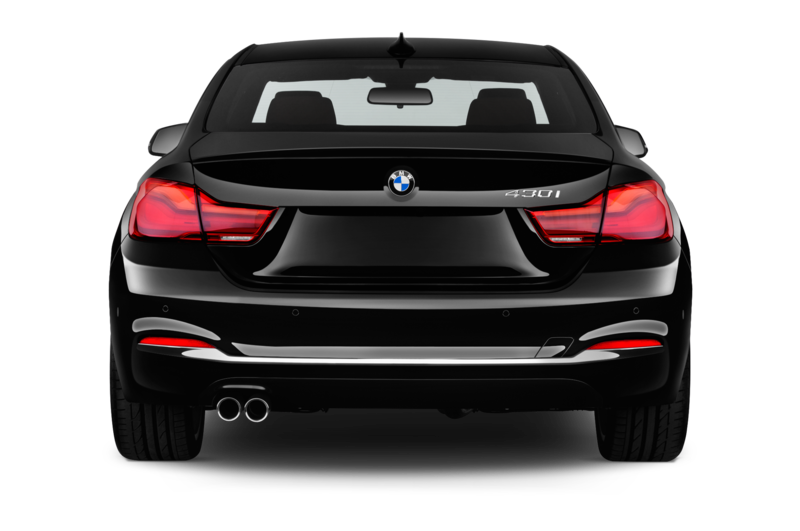 The ungainly exterior appearance comes from marrying a 7-series wheelbase to a 3-series overall length. 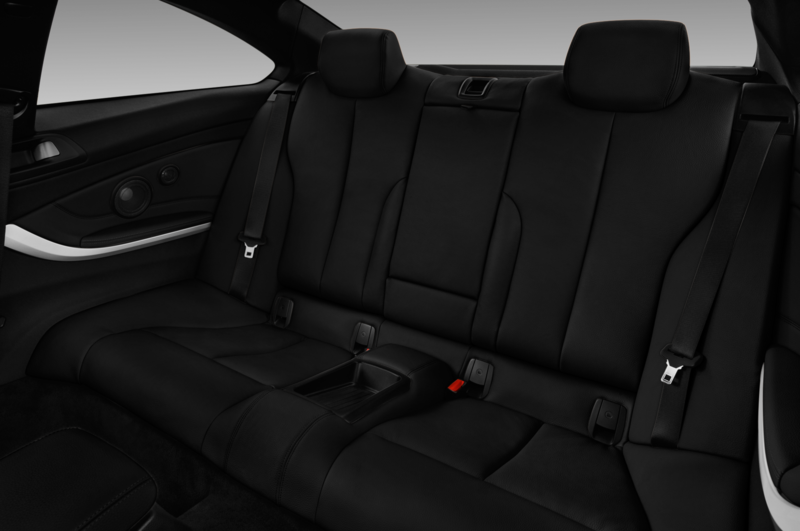 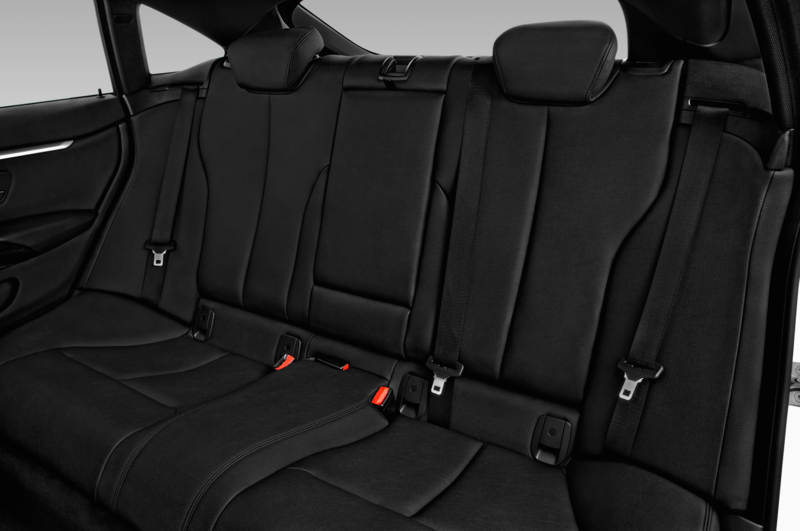 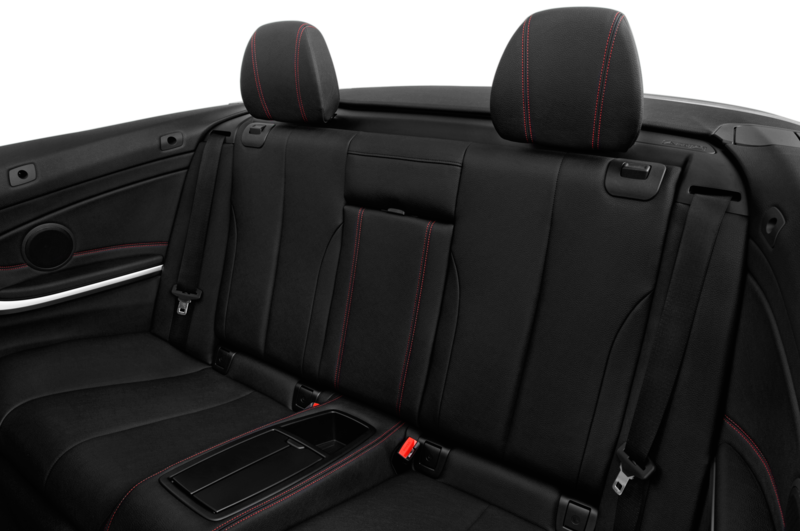 The combination does provide ample room for five passengers. 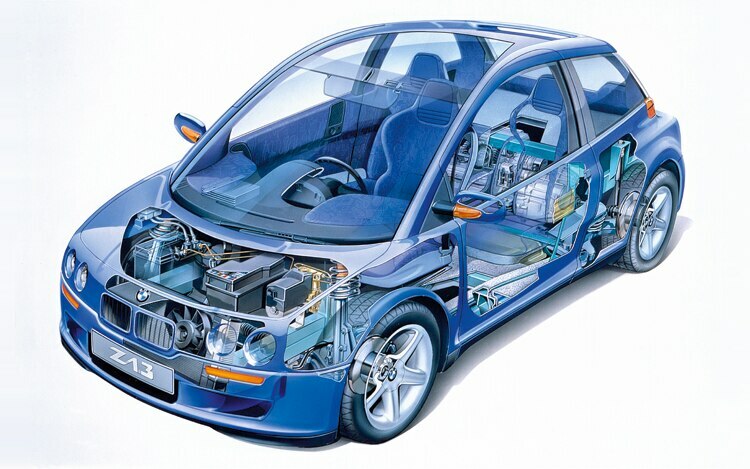 While the 39 mpg fuel efficiency doesn’t seem that impressive today, it was a stretch ten years ago, before hybrids arrived. 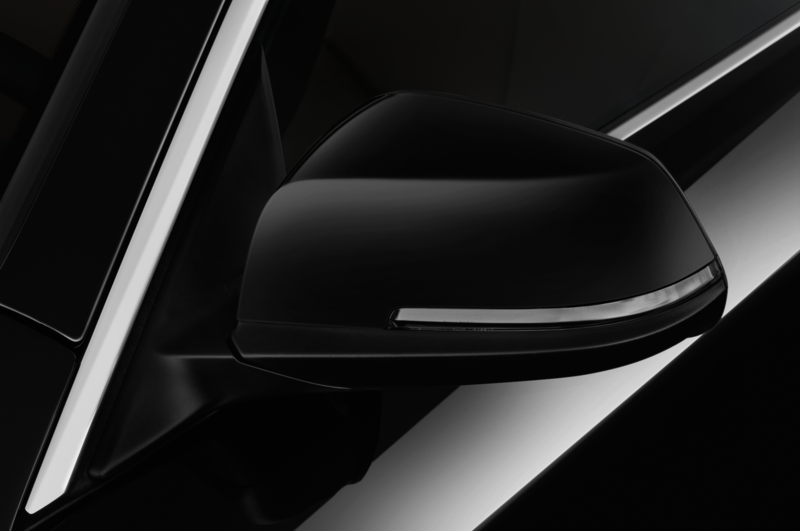 Z29 CURTAIN CLOSER The final project car constructed at the Techniks think tank explored light-weight construction with a creative mix of aluminum and carbon-fiber structural materials. 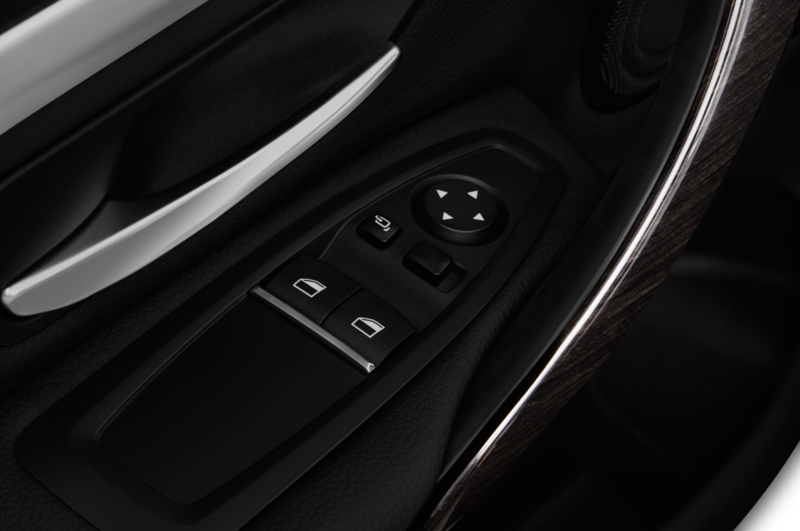 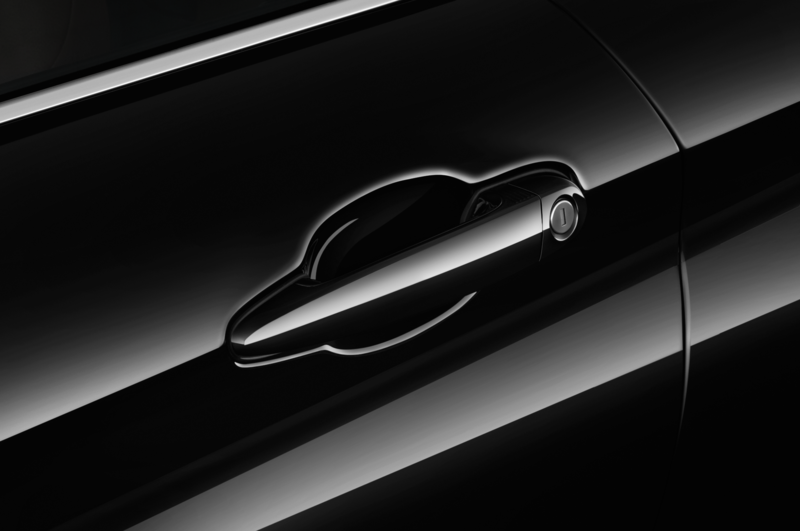 The Z29 is equipped with scissors-hinged doors for access to the two-place interior. 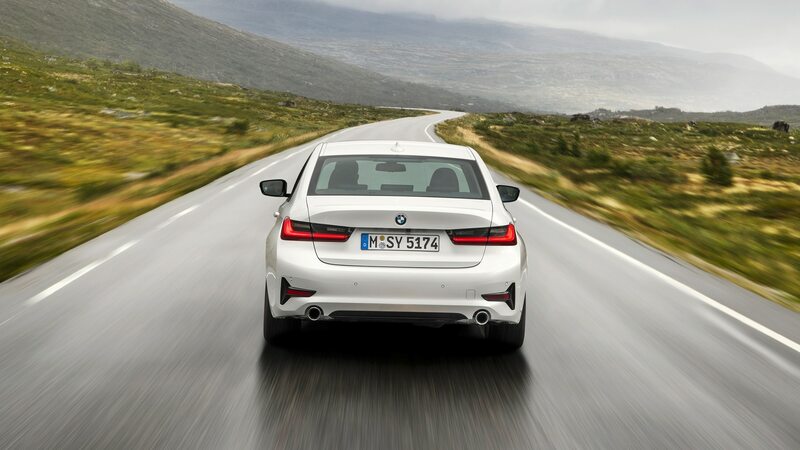 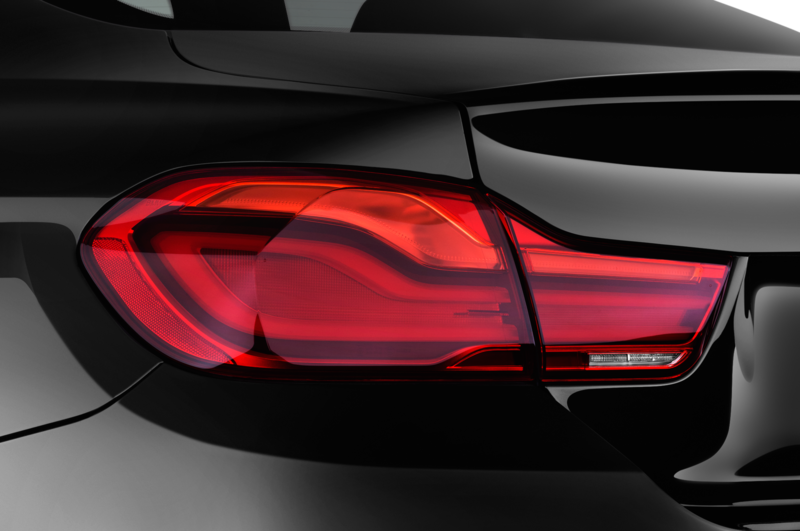 A 343-hp six-cylinder engine provides convincing thrust. 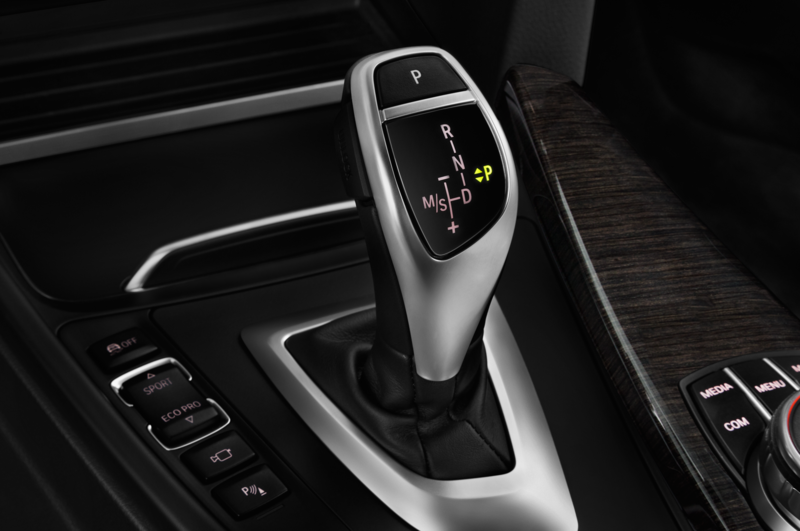 A six-speed sequential transmission delivers torque to the multi-link rear axle. 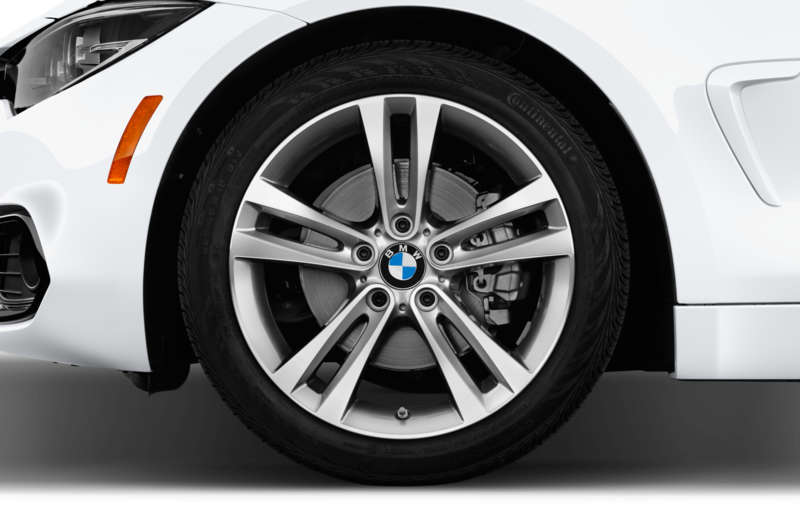 Curb weight is a feathery 2560 pounds. 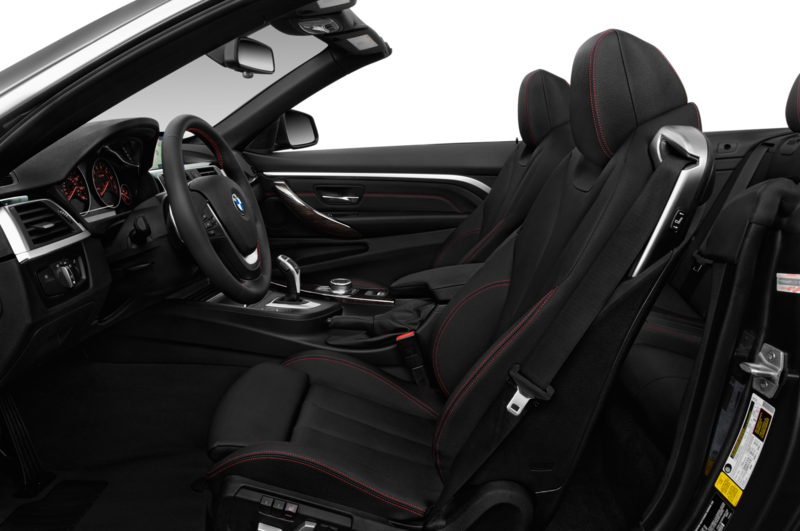 The claimed performance is 0-60mph acceleration in 4.4 seconds and a top speed of 168 mph.